Discussion in 'How I Made It: Tutorials' started by dancom, Feb 20, 2016. 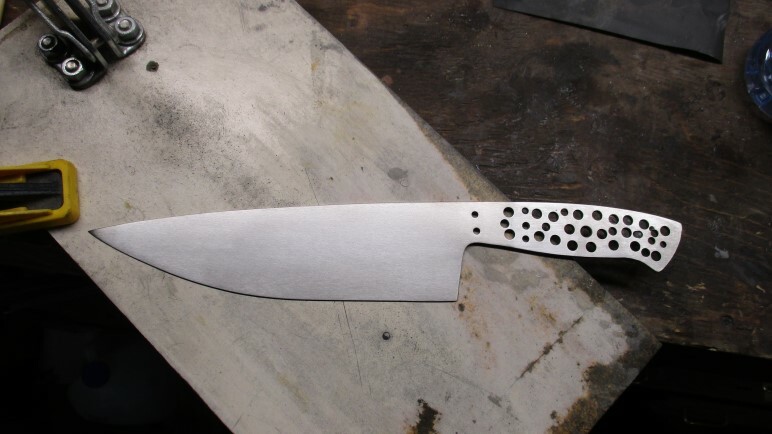 In light of Bob Kramer (my hero)'s auction of a chef's knife which fetched over $36,000, I thought I would attempt to make one. 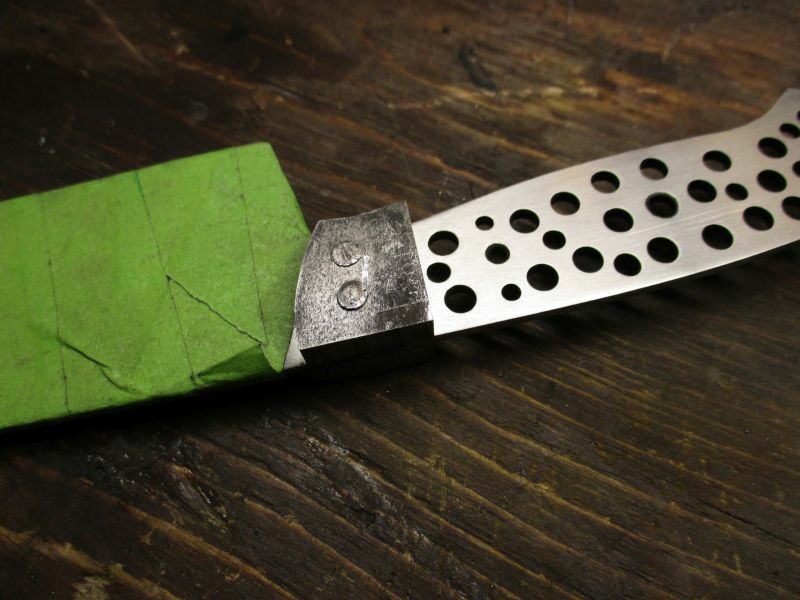 OK, no meteorite or even pattern welded steel but the basic form should end up close. I'll post some more as it progresses. Putterer and bobbybirds like this. Full flat grind on that bad boy? All of my mom's kitchen knives (all German made, coincidentally) are full tang. Some of the handles are starting to let go due to age and 40-odd years of hard use. I might have to steal them and put new scales on for her. Yup, going for full flat with distal taper. 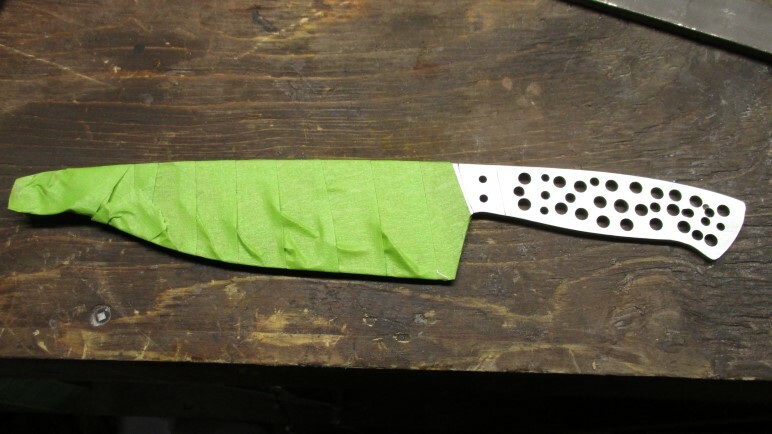 I've already got it down to 0.015" so it will be getting a bolster and scales this weekend. You should definitely consider doing a re-scale. That is the fun part! So how exactly does a guy do a distal taper? I've done some reading, but I'm having a bit of a time visualizing it. 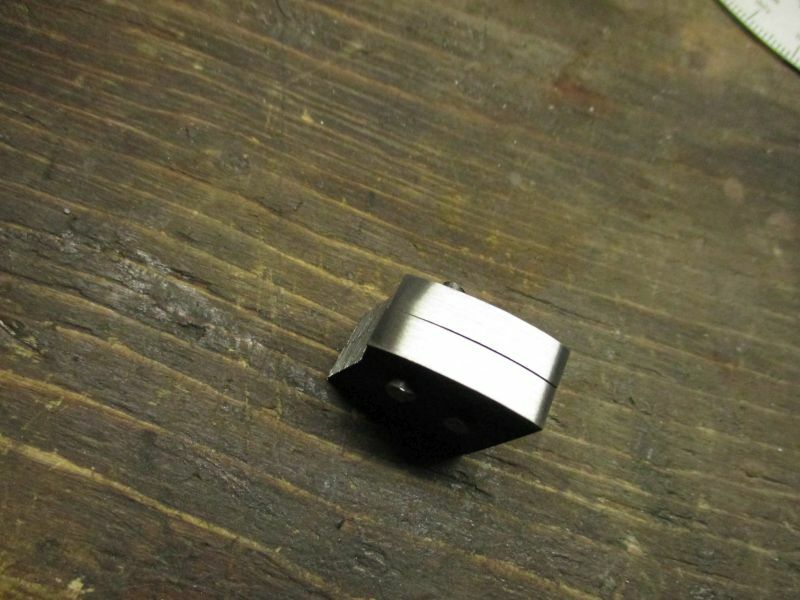 After grinding the bulk of the bevel down to about 15 thousandth with 120 grit, I hand sanded with 120, 320 and 400. Then used the very find conditioning belt. The tip is not burnt, it's the overhead fluorescent light playing tricks with reflections. I used my protractor to predict where the front of the bolster will go. 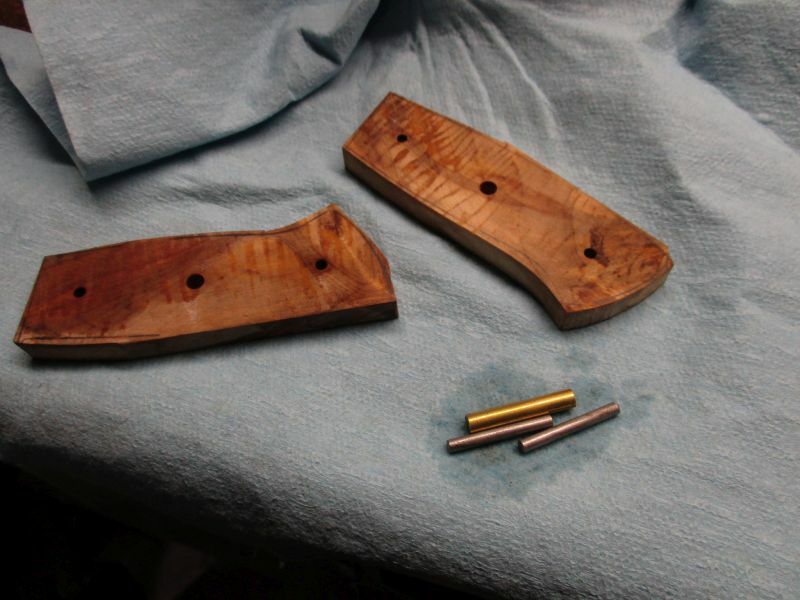 Position of bolster pieces. Requires two 1/8" pins. 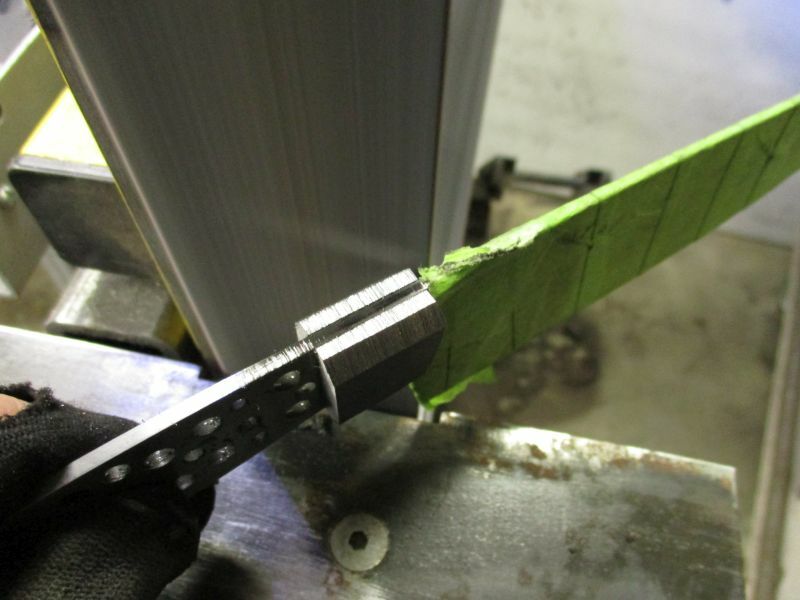 Now I know where the bolster is going to be, the blade can be taped up. I'll cut and shape the bolsters hopefully tonight. Nope, more like bolster nightmare in Canada. This took me 2 hours. I did take more photos, and my Poloroid camera is probably slowing me down. Click on a photo to see the big version. It's linked to my blog. 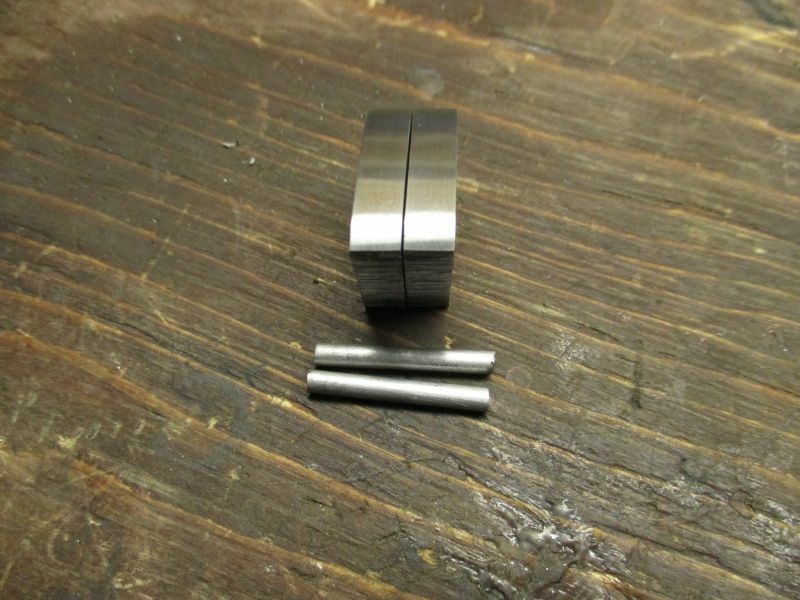 I will make the bolster pieces from 416 stainless steel and pin these with 416 stainless 1/8" pins. 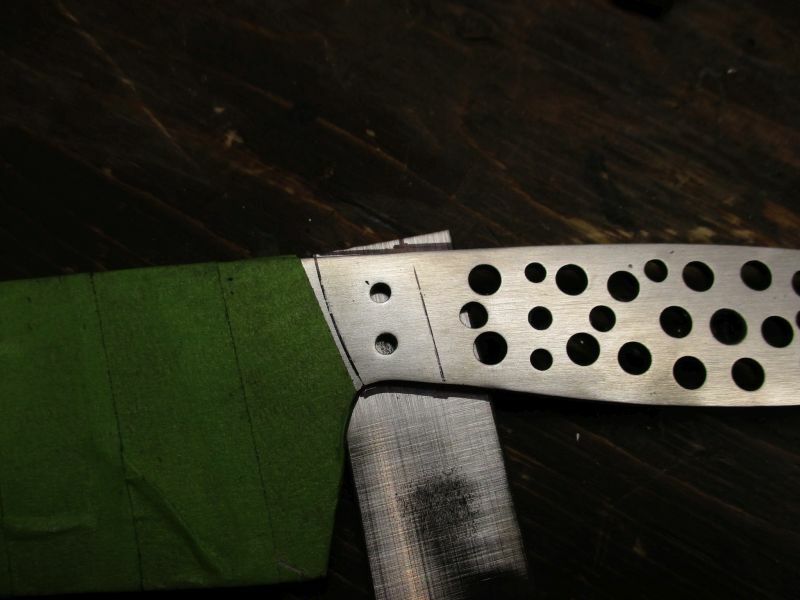 The first part is to lay them out on the 416 bar stock. While it's still on the bar, I cut 80% through and shape it a little. This gives something to hang on to. Holding little 1" pieces is a pain. Eventually one has to separate the twins and mark them L & R.
I clamp and drill one side, then pin and and clamp and drill through. Sometimes a second drill bit comes in handy. 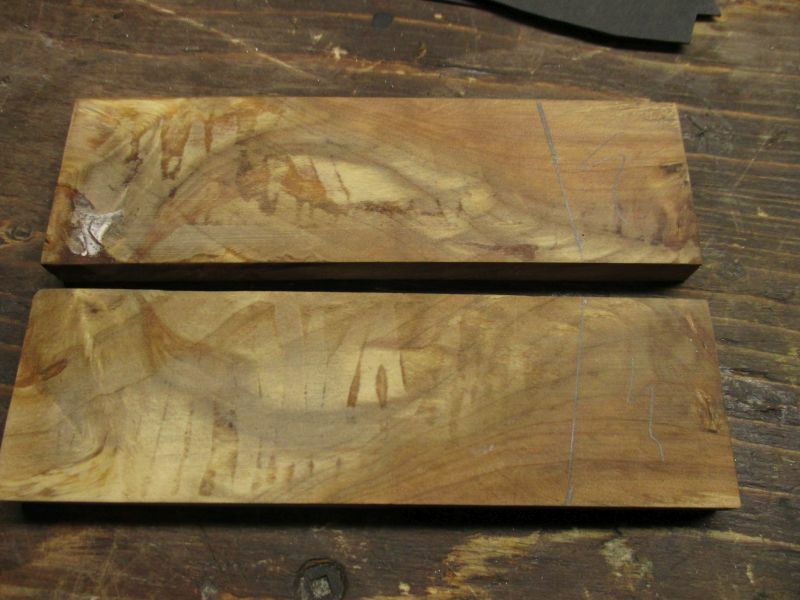 I straightened and smoothed the backs of the bolster pieces. I used a NORaX X65 (equiv. 220-240 P grit) for both the fronts and backs. After drill the bolster pieces, I blam them together with 1/8" steel round. This holds them while I shape the fronts in unison. Then polished lightly with some green compound on the cotton wheel. I deburred (probably a bit much) the insides of the bolster pieces. Sanded and cut some 1/8" 416 stainless round stock. I made them about 3/16" longer than the total length needed. These are about 7/8" long. Slightly longer than needed. 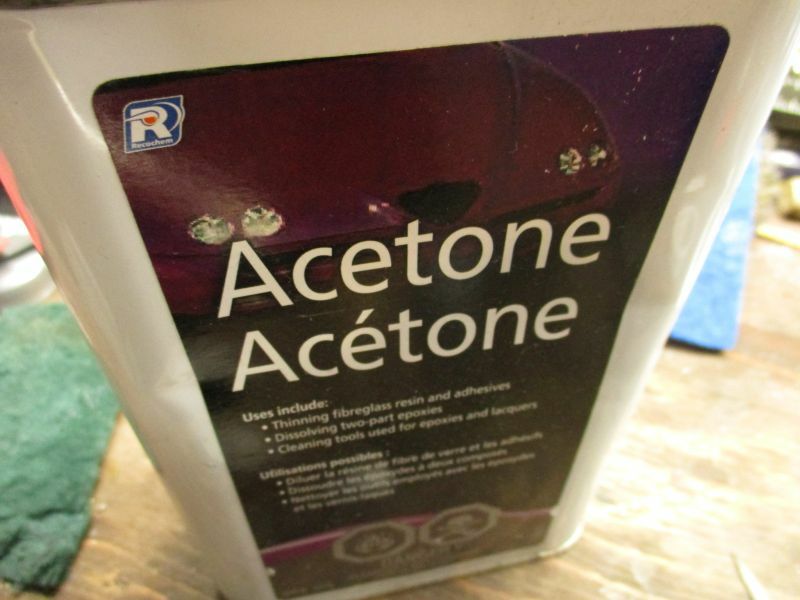 Grabbed a can of acetone and washed the parts. And cleaned inside using a clean artist's brush. 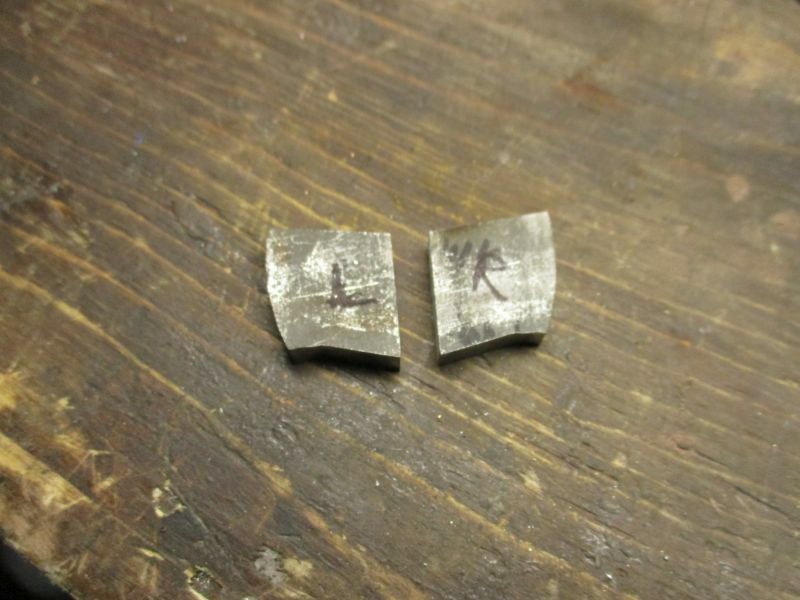 After some gentle tapping with a ball pein, the two pieces were aligned. I took the whole thing over to the 20 ton press and prayed to the Gods of Compression. 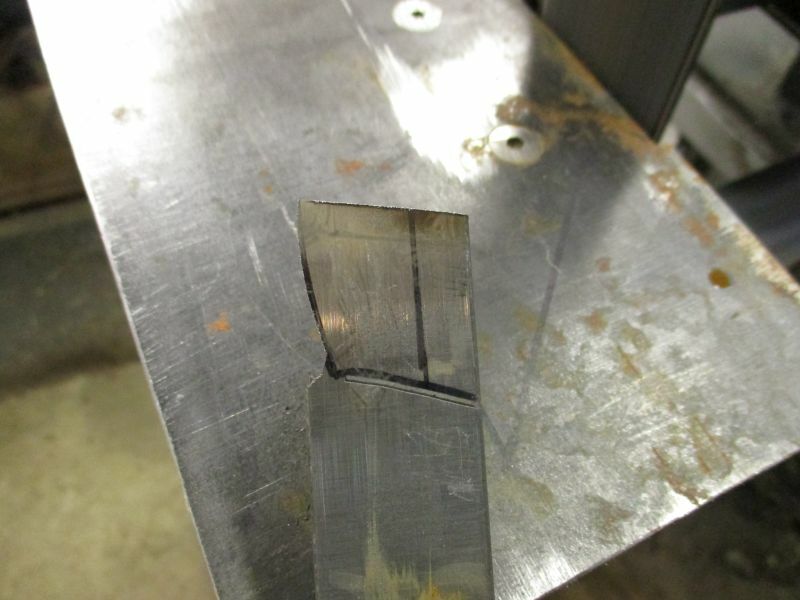 I wasn't 100% convinced, so I bashed it with a 20 oz ball pein against the anvil for good luck. Oh my, this looks bad. 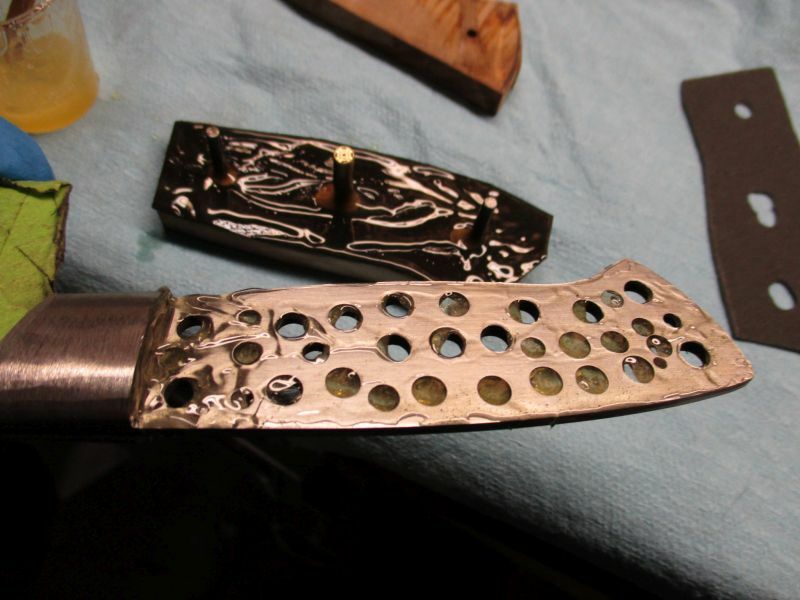 Luckily, the pins are pressed hard and being clean it extreme pressure "welds" the pins and bolster. 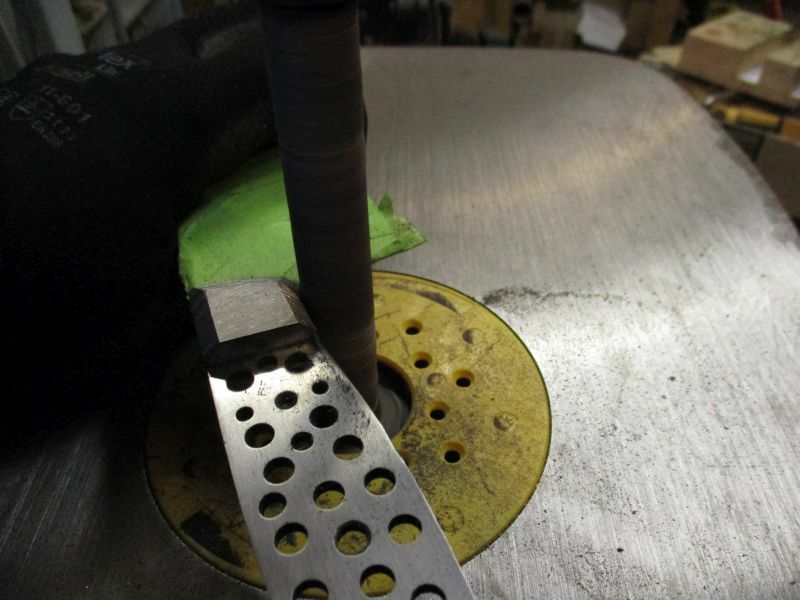 Some grinding shows the initial disappearance of the pins. Some further grinding shows...well that there was nothing to show. I use water when grinding to keep the heat down. I don't want to kill the temper by frying a bolster that's attached. So that's where it ends up tonight. 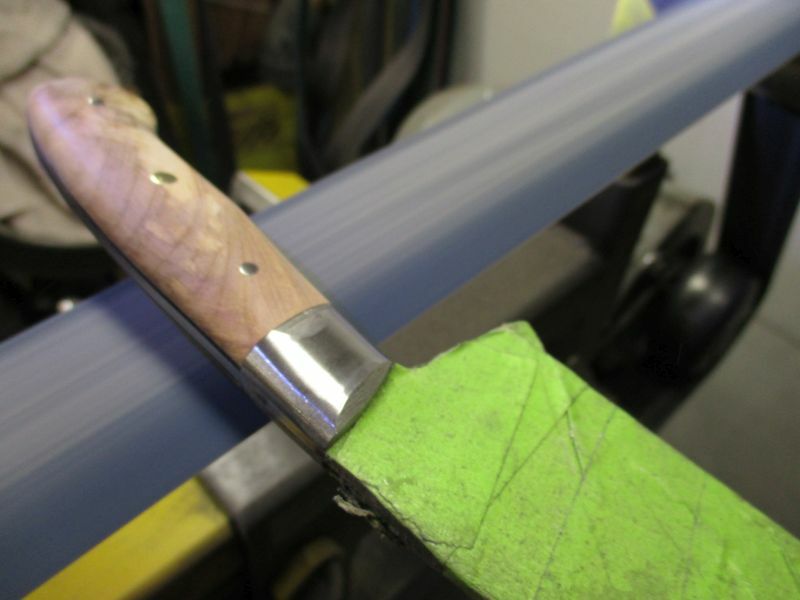 I will shape the bolster a bit on the round before working on the rest of the handle. 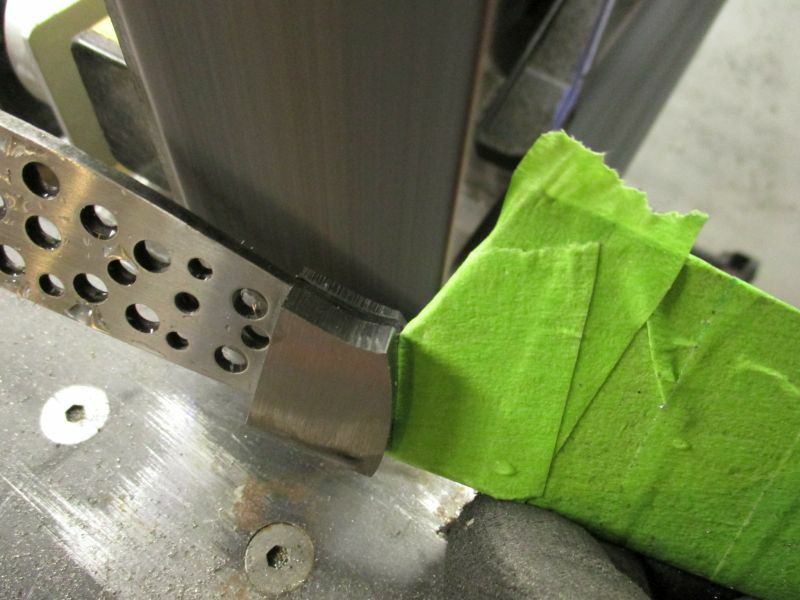 This reduces heat on the epoxy that is used to seal the scales. 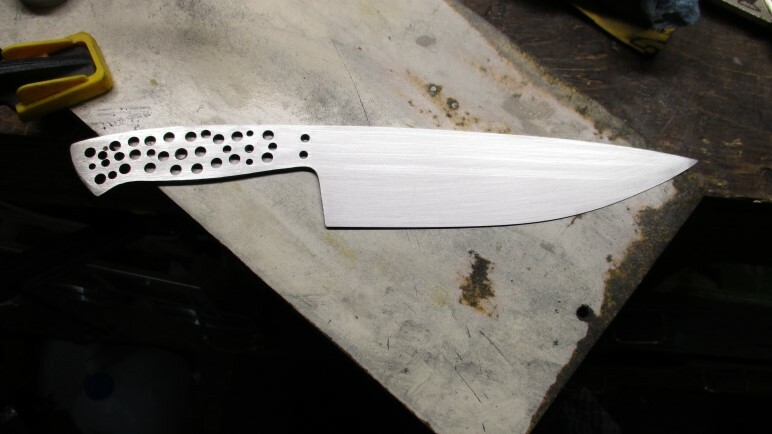 The blade looks awesome so far. Once again, thanks for the build thread. Every time I read these I learn new skills. I was hoping to make glue-up tonight. 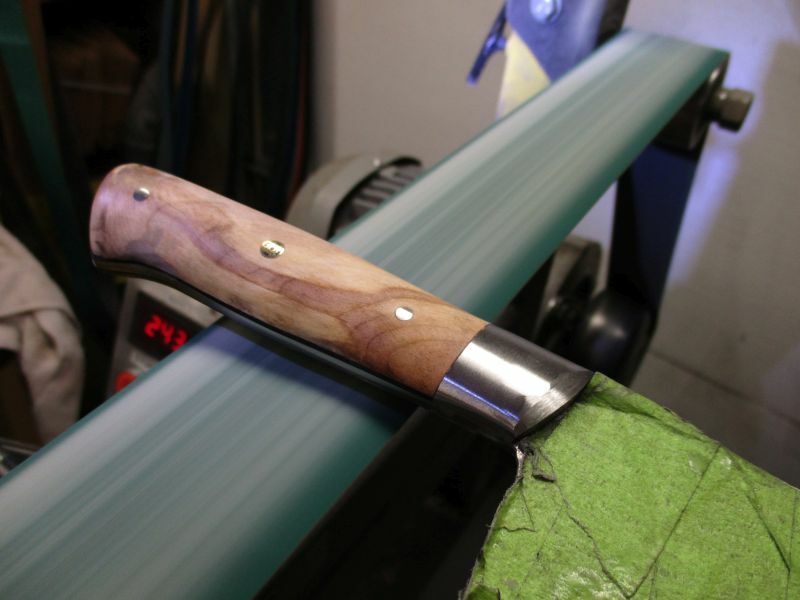 With the bolster, I want to get the shape pretty close to final shape before attaching the wood scales. 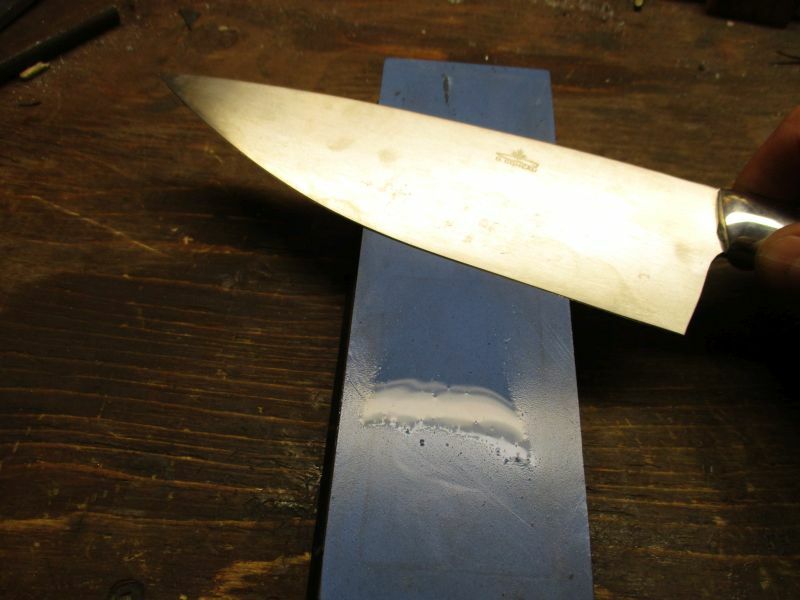 The steel is much harder than the wood and there's a tendency to remove more wood than wanted when grinding the handle to shape. 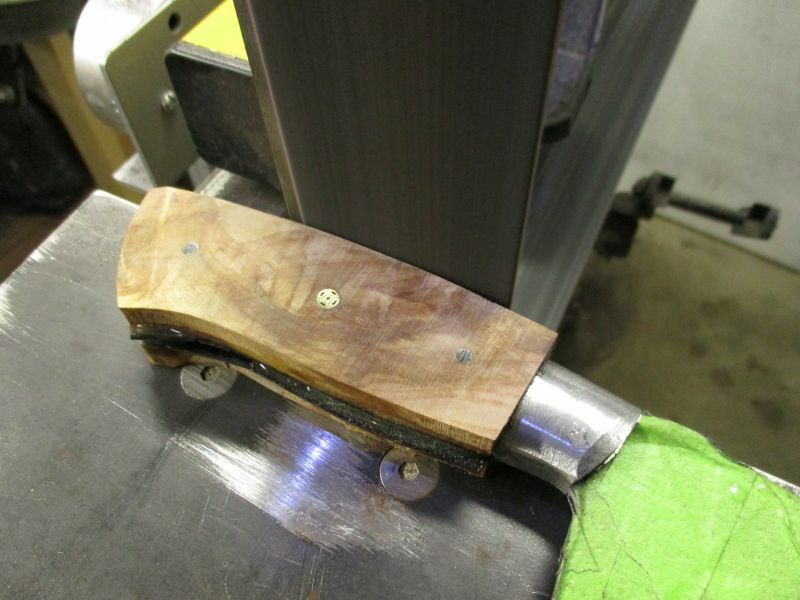 This creates a noticeable ridge where the wood meets the steel bolster or pin. 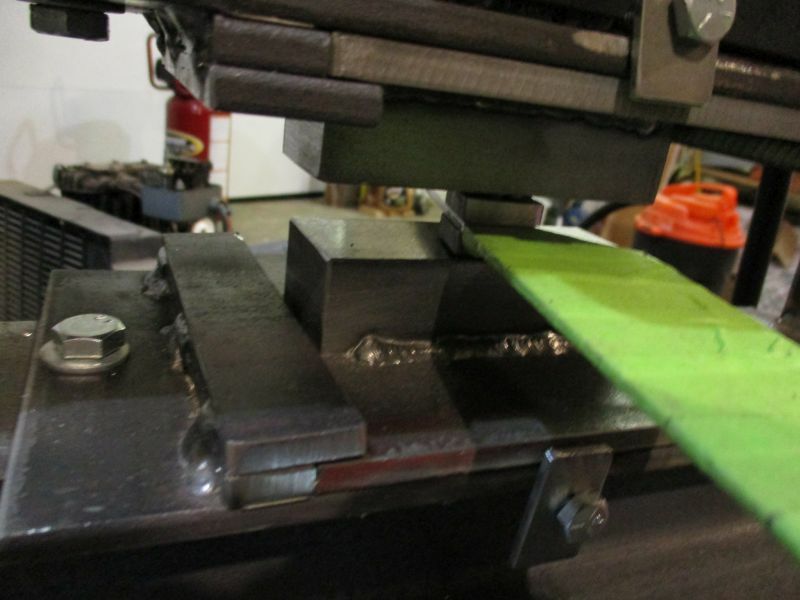 Here I am knocking off the corners with a 36 grit belt. Being super careful not to nick the blade or tang. Right now it's just getting the bevels on. These will be smoothed out later. After the top and bottom, I do one on each side of the front. 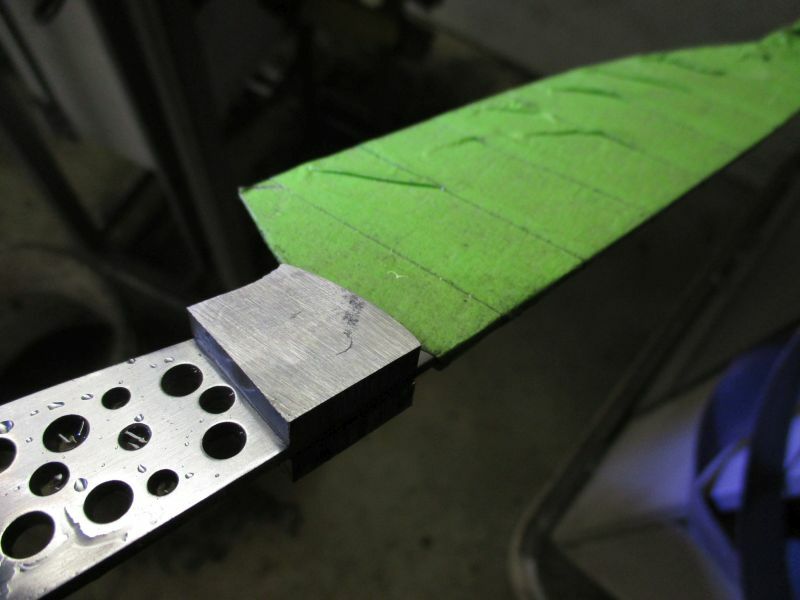 A little arc will help the belt track the curved shape. This is the result. Again, rough grinding and dipping in water to keep things cool. 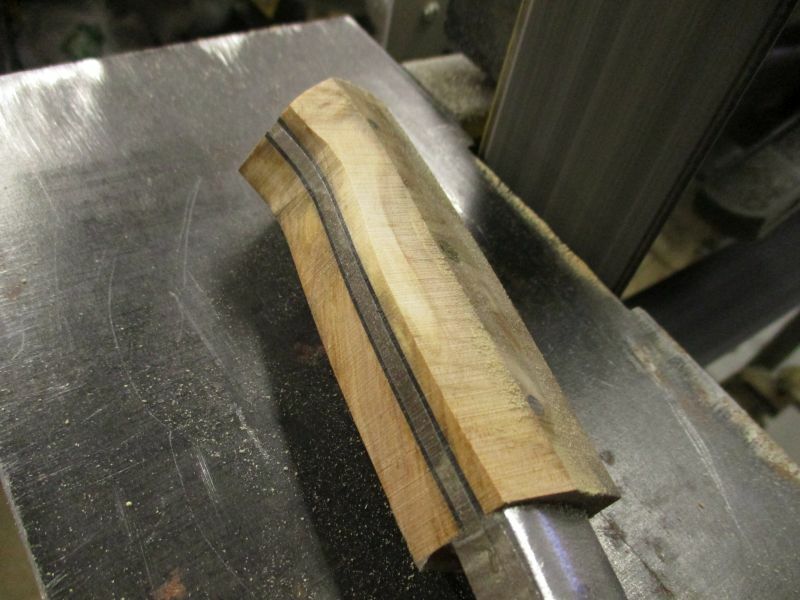 For the inside curve where the bolster meets the blade, I used the spindle sander. 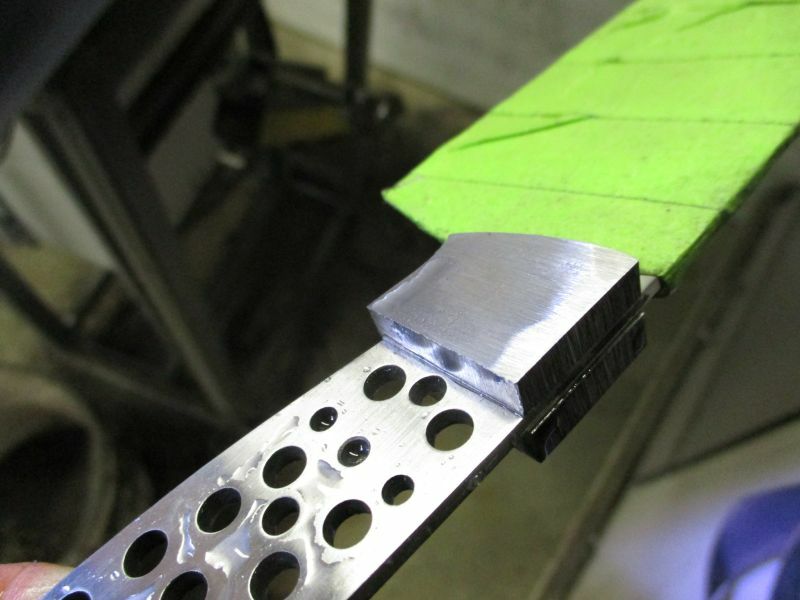 The small wheel attachment would work or a round file. This is convenient and I don't have to change the tool arm on the grinder. 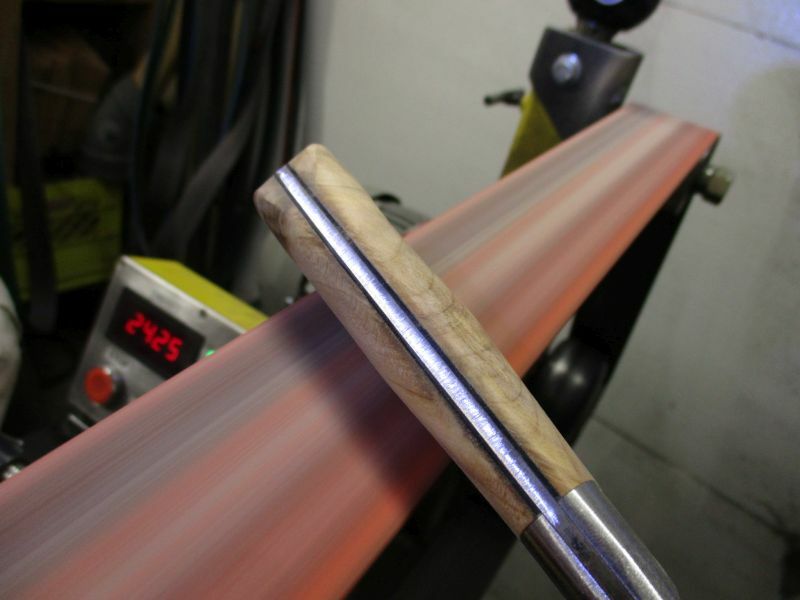 I change the belt to a 60 grit and repeat the beveling sequence. Only this time I introduce some increasing angles to sort of blend the bevels back to the faces. 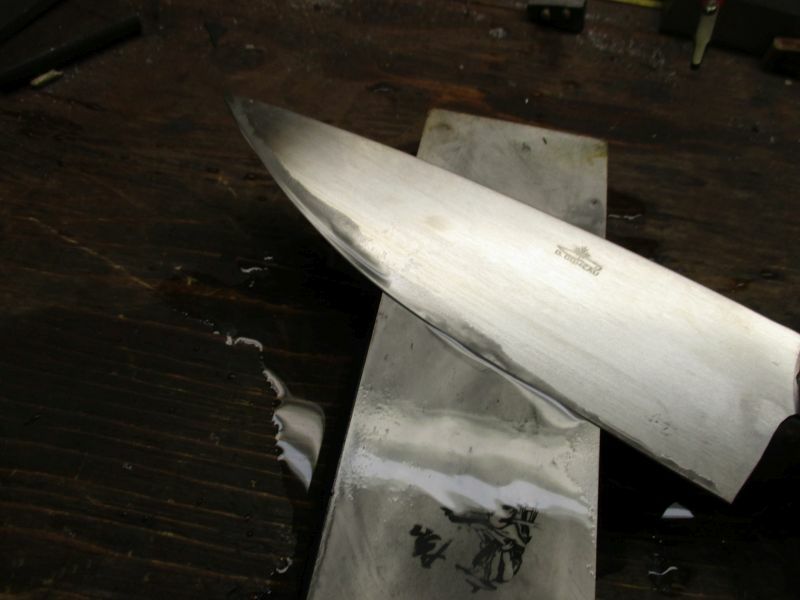 that will allow for more of a finishing process when the scales are on. 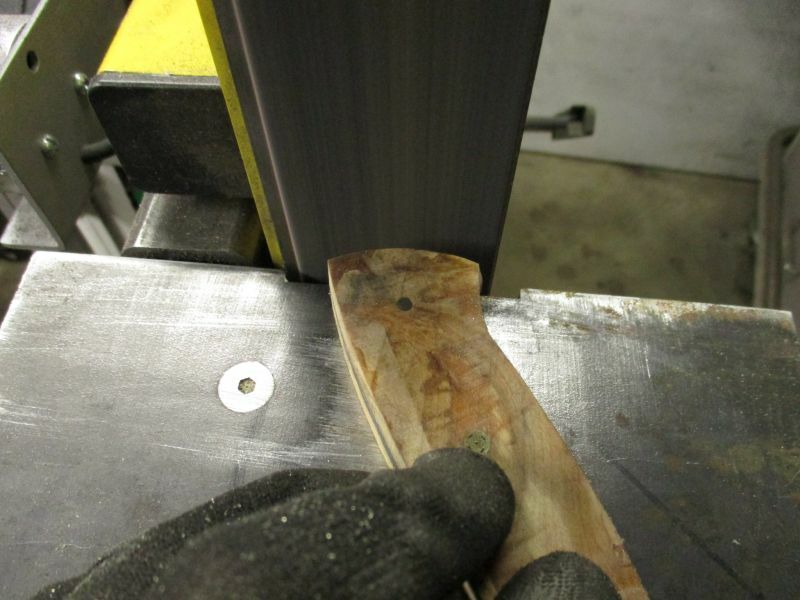 For the handle, I will line the steel with some black vulcanized fibre spacer material. 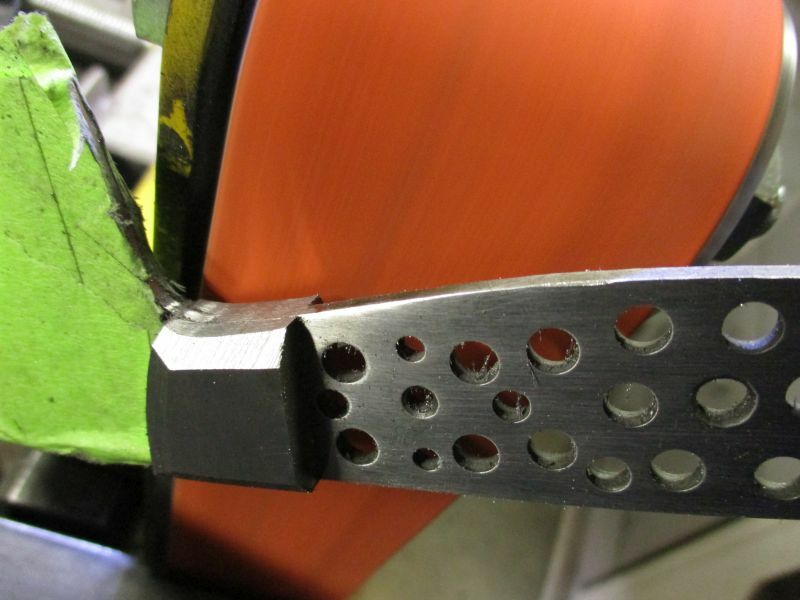 Holes for the pins to pass through can be punched with a 1/4" paper punch (heavy duty kind). You could drill the holes in the spacer material, but I've found drilling leaves heavy burrs that need to be cleaned before assembly. The scales are book matched yellow birch that I stabilized with Stick Fast. This wood without stabilization makes an excellent handle. 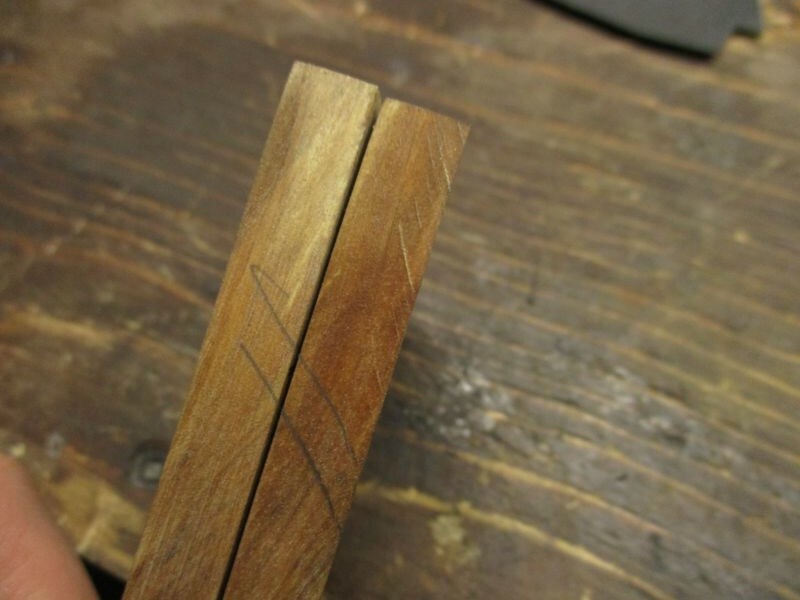 I do a practice layout and determine what part of the wood goes where when the handle is complete. This can be confusing so I marked the pencil lines to help me figure it out. Sometimes I put "LO" and "RO" for Left Outside and Right Outside respectively. 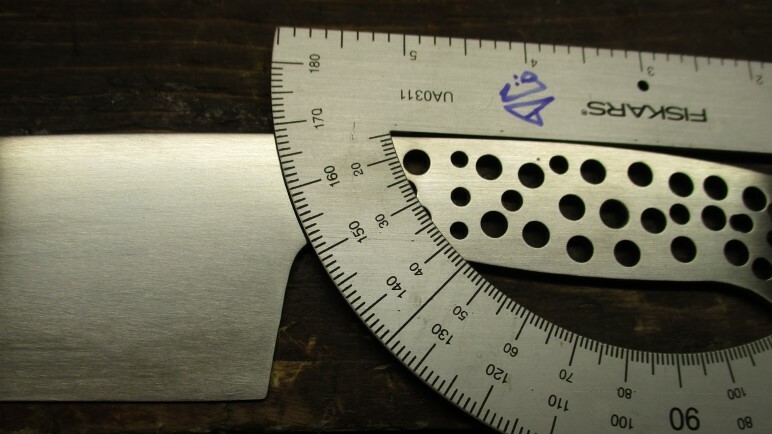 When working with book matched scales, mark the tops. I mark some lines on an angle so it cannot be mixed up. 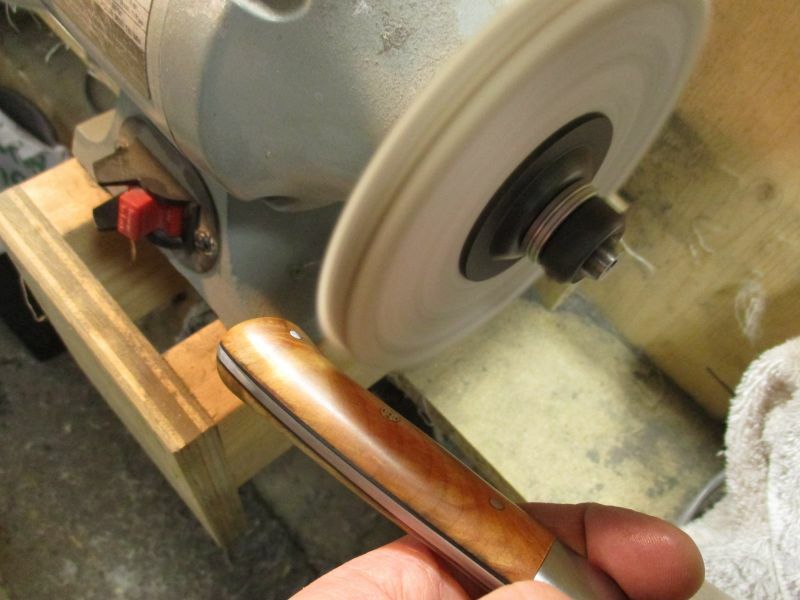 This is about making sure the grain moves across the handle and looks good from all directions. 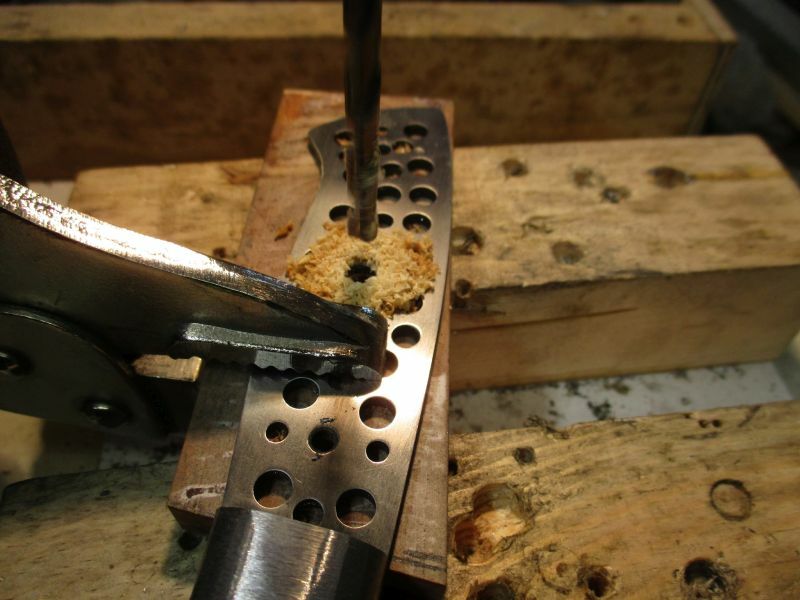 Clamp gently with Vise-grips and drill the holes for the pins. I am using 2 pins @1/8 and a centre pin @ 3/16". After drilling and while still in clamp, I scribe a pencil line outside the tang. Repeat the drilling and scribing for the other scale. 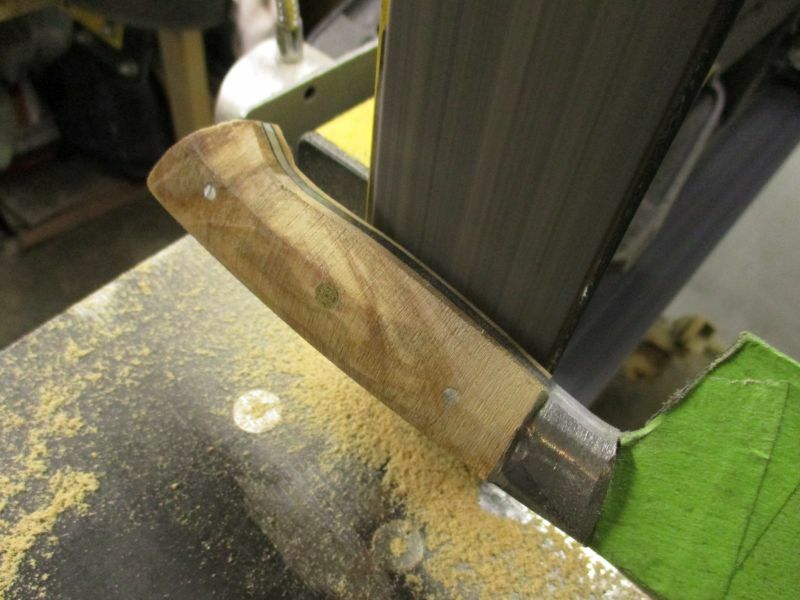 Now we can safely trim the scales on the band saw. 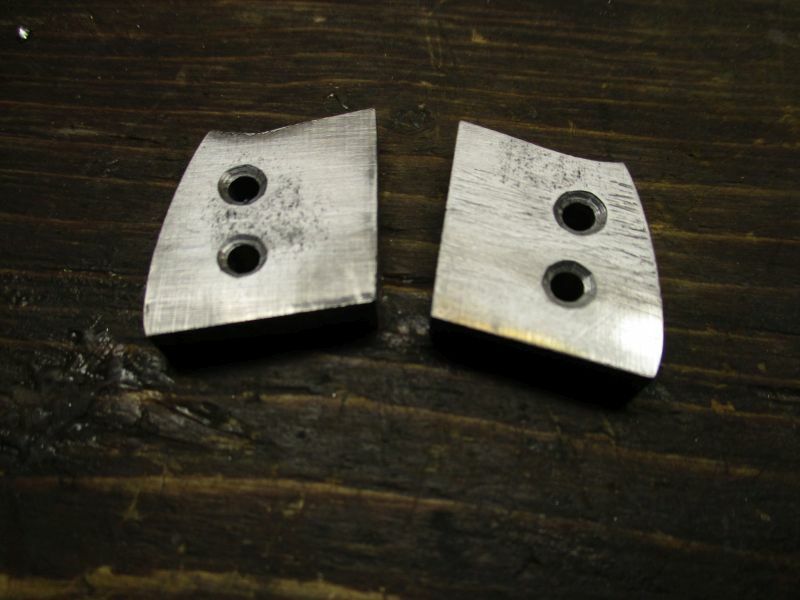 With the liners roughed, the scales roughed, I cut and chamfered the pins. The pins are around 1". 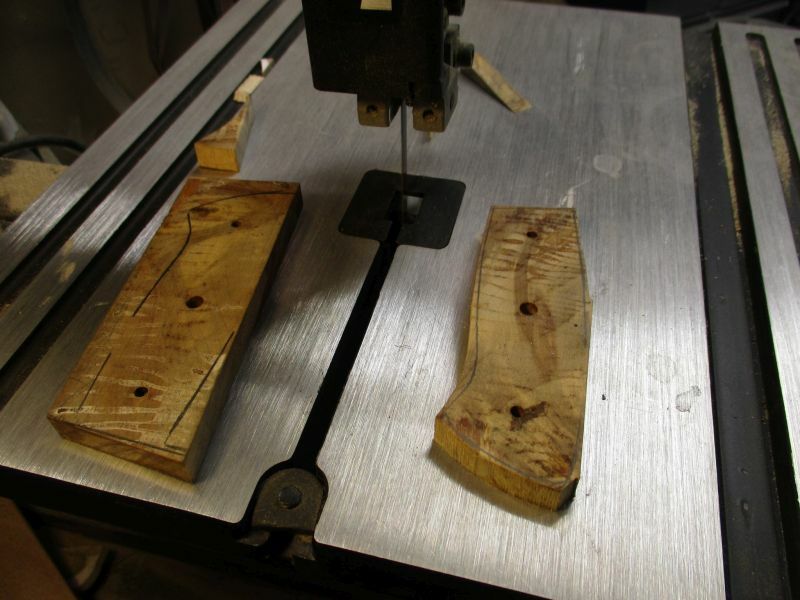 Cut them with a hacksaw or metal cutting bandsaw. 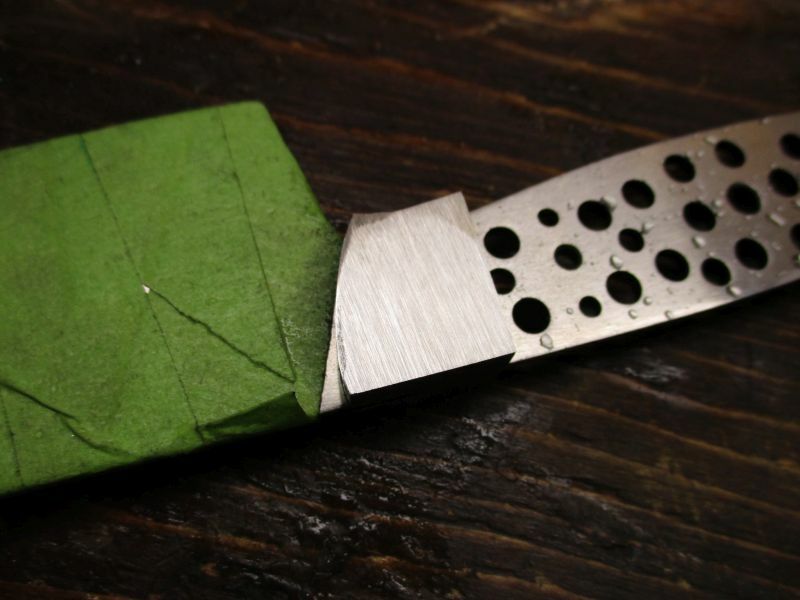 Remove any sharp edge with sandpaper. 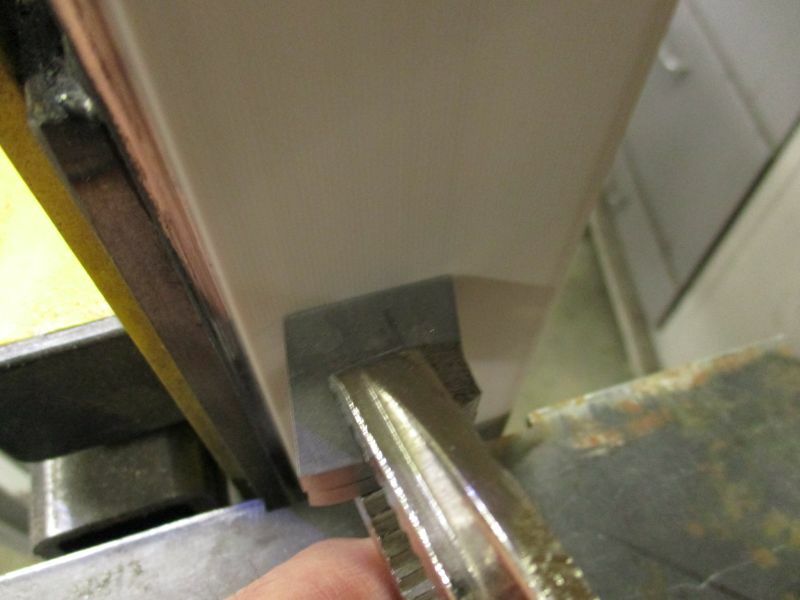 Sharp edges can snag and cause tear through and break the wood away when assembling. Using a brush and some acetone, I clean the backside of the scales and wipe with a shop towel. 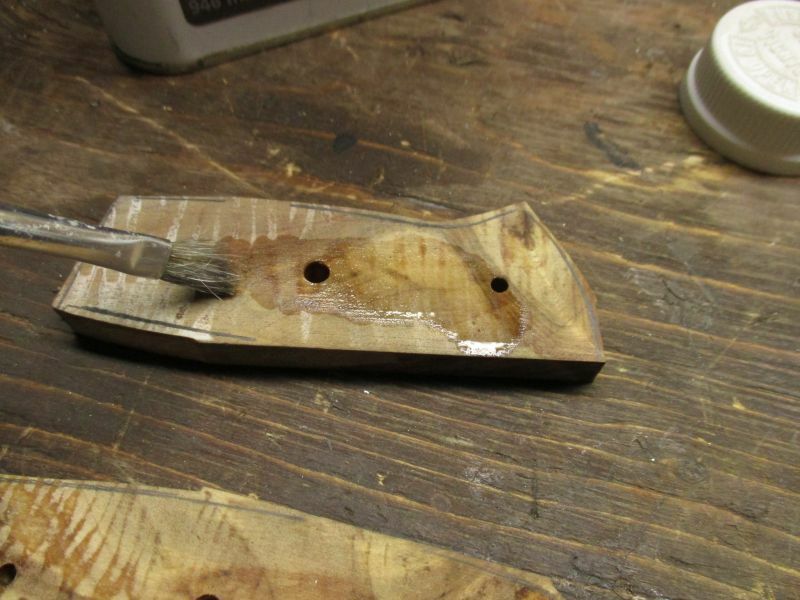 This reduces the surface oils in the wood from preventing the epoxy from adhering. 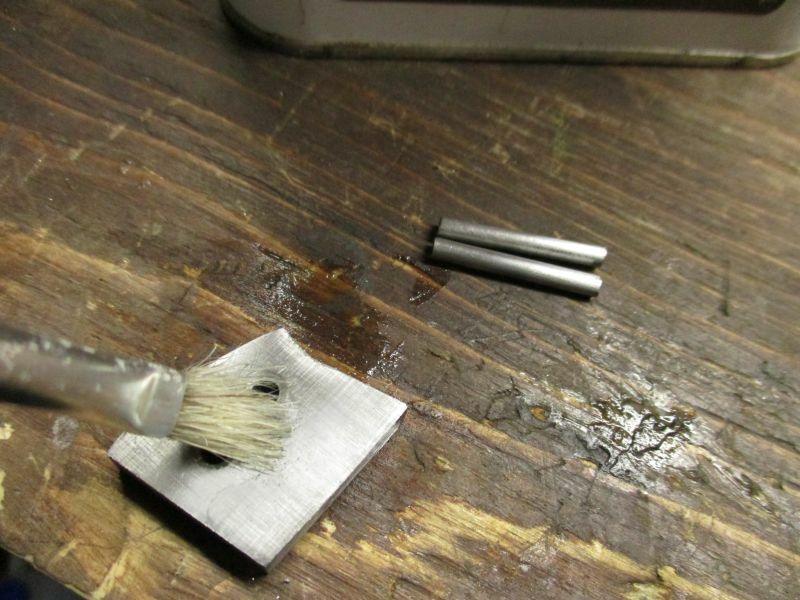 I also clean the pins with acetone. Ready to glue up. I like to lay everything out like a surgeon and don my nitrile gloves. I mixed about 2 tsp, 10 ml of West System's G/flex. I mix this for about 2 minutes is a slow stirring action, trying not to whip it and add air. 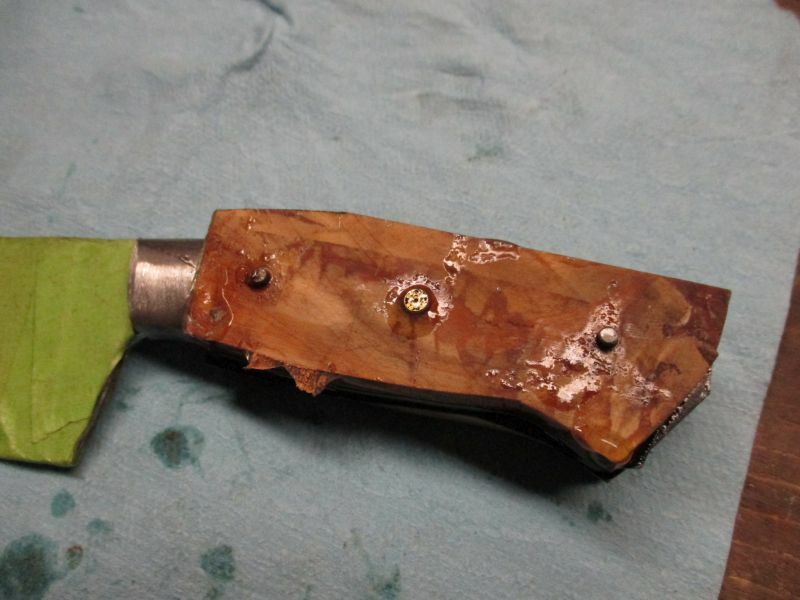 This is amazing epoxy. Like all epoxies, it works best if you keep everything as clean as you can. With a coffee stirrer or Popsicle stick, spread the gold. 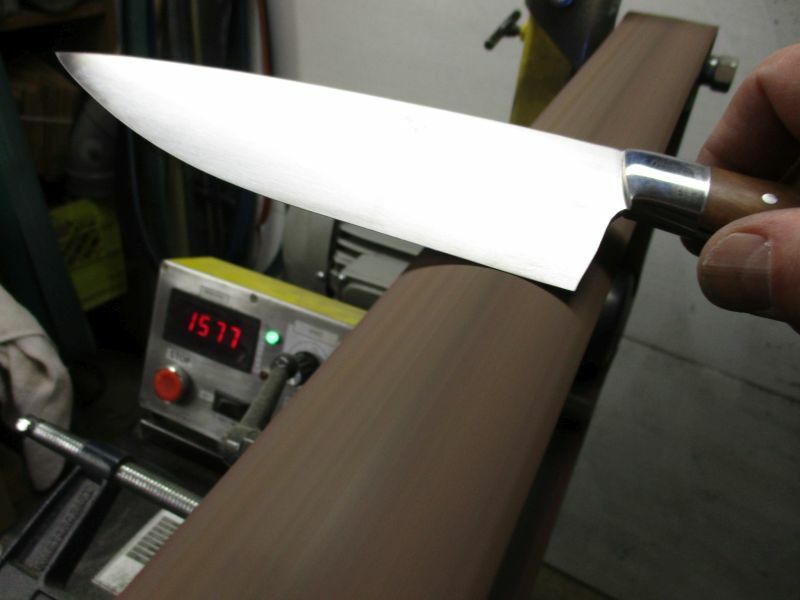 Every layer of our handle gets a thin coating of epoxy. I start with one side and work towards the other side. This may be unconventional, but I find it works. 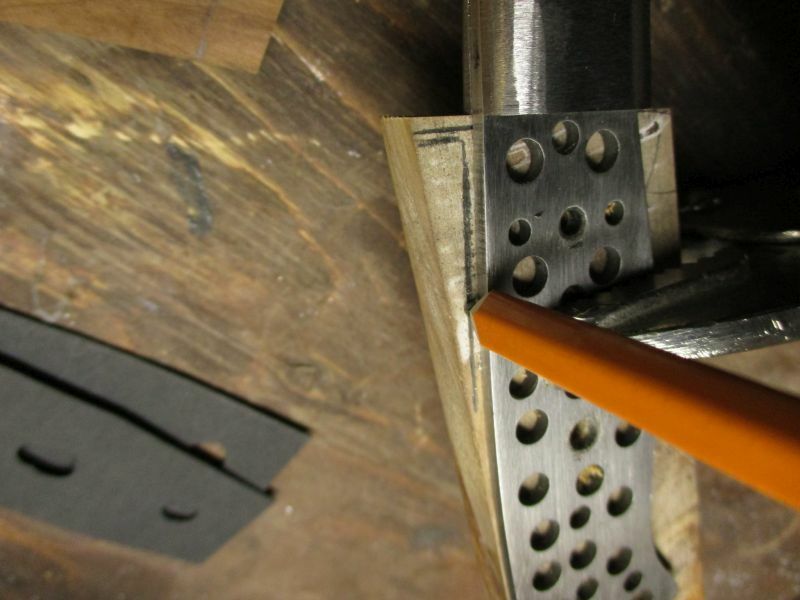 Starting with coating the three pins and pressing them into the right scale. Then coating the right scale, then coating the liner. 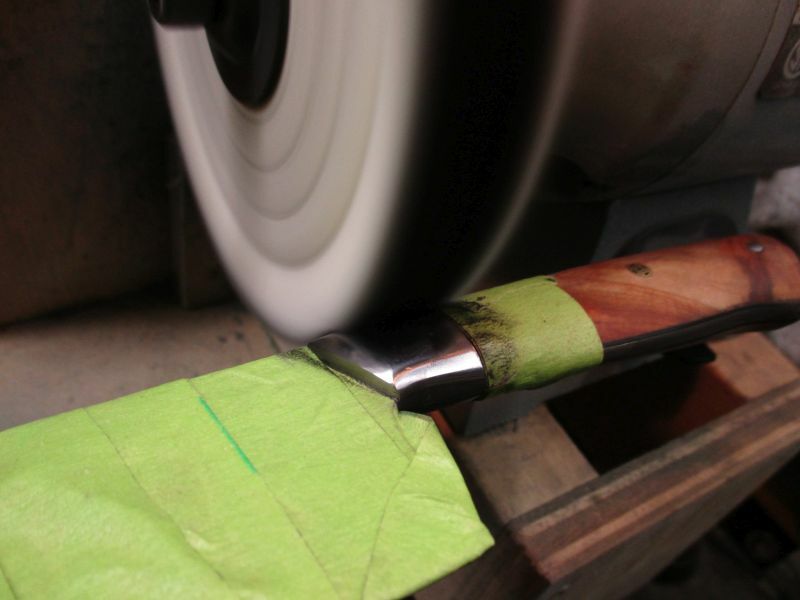 Then coating the right side of the tang, then sliding the right half on to the tang. 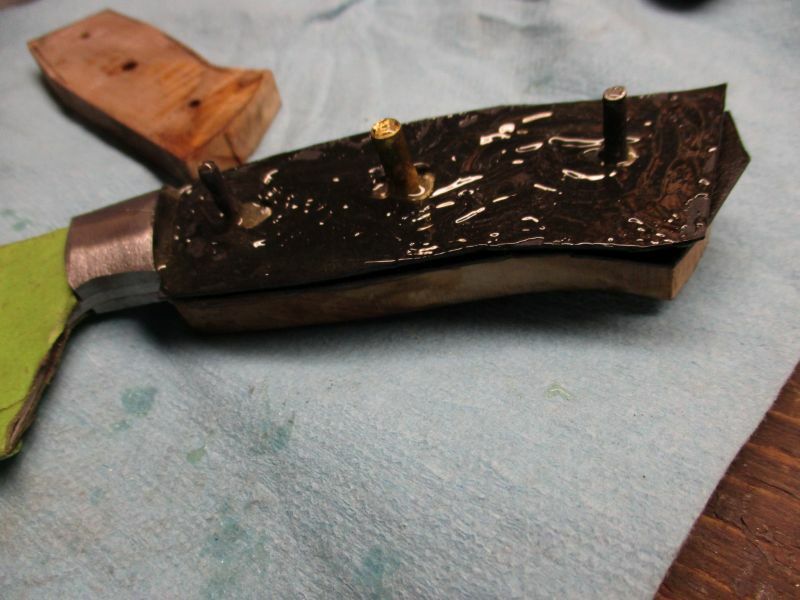 Be sure to add some epoxy to the front of the scale and the bolster. You want this to ooze here for sure. Tap the pins through gently if they are not flush or better. Start the stacking process on the left side. 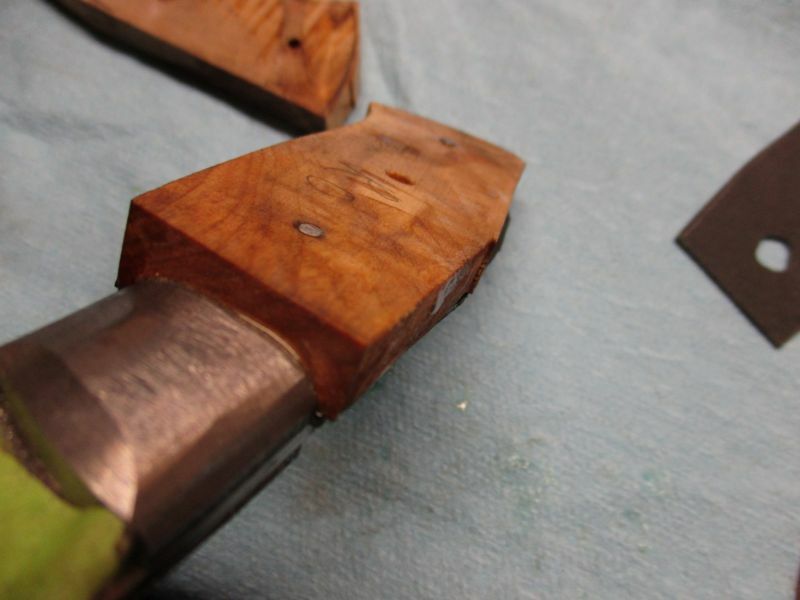 Each adjoining surface gets a coating of epoxy. 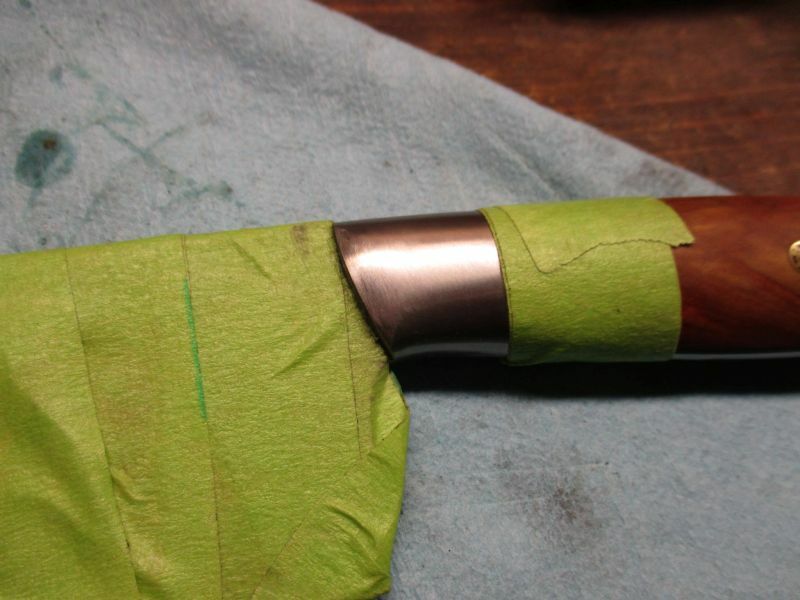 Once the handle is complete. Clamp with medium pressure. but enough to make sure everything is closing together. 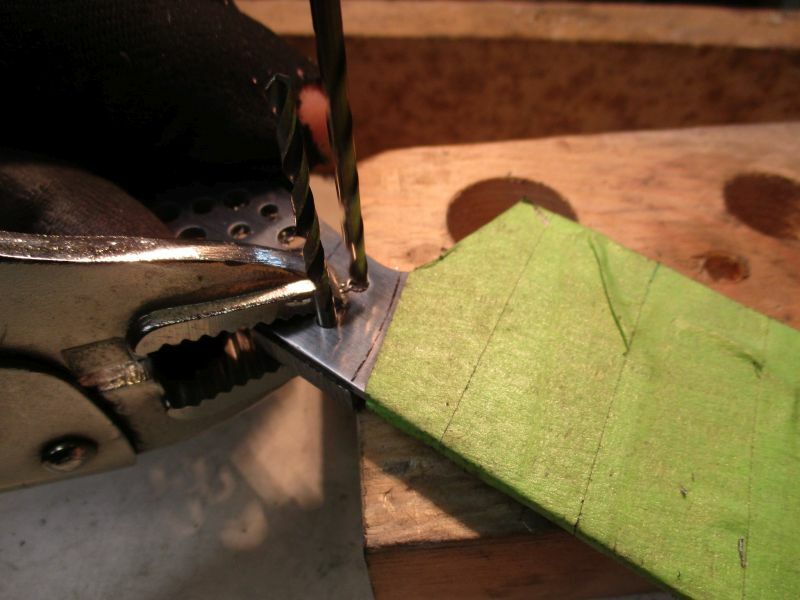 I used cheapo vise-grip with leather pads and some c-clamps. I like to clamp between the pins. 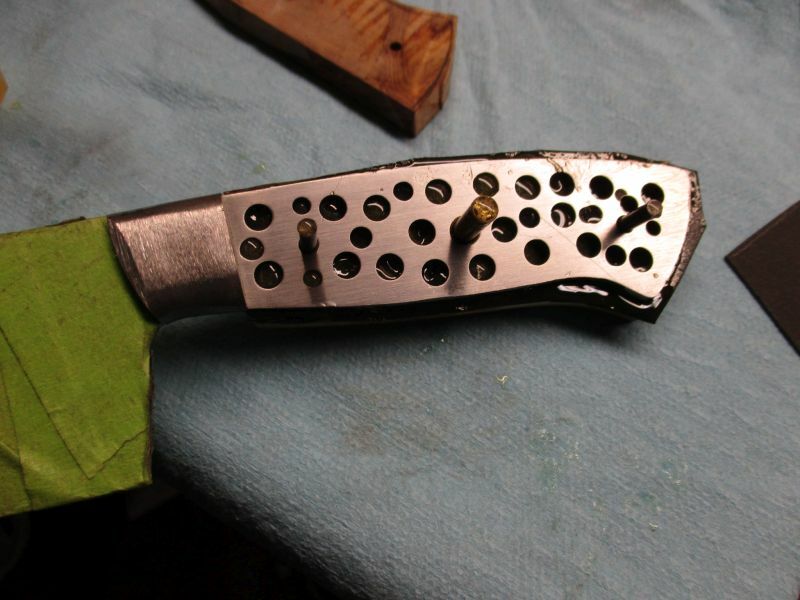 With this knife I clamp: front, front middle, rear middle and rear. 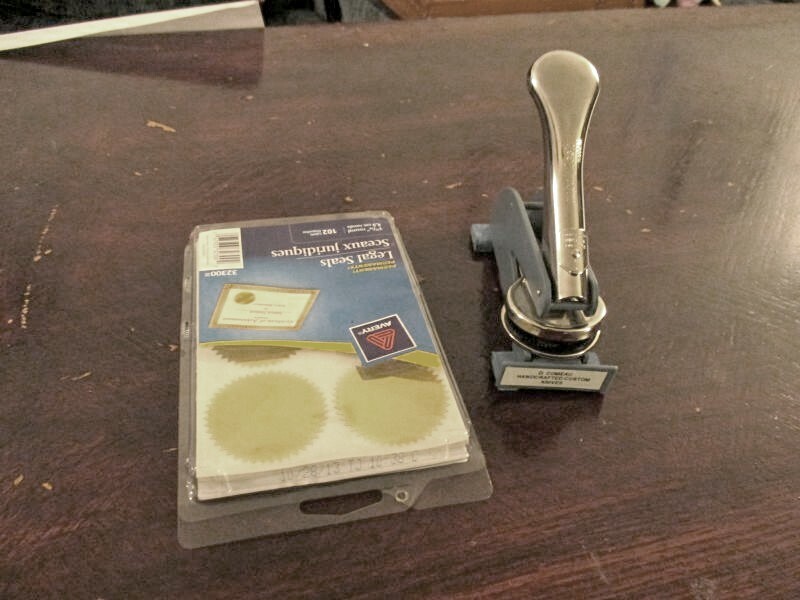 The photo is showing two essential clamps. So we're done for tonight. I brought it inside and set it by the furnace heat register on a plastic shopping bag. This epoxy will drip. It will take several hours to cure at 20°C. I let it go overnight to 24 hours depending on the temperature. 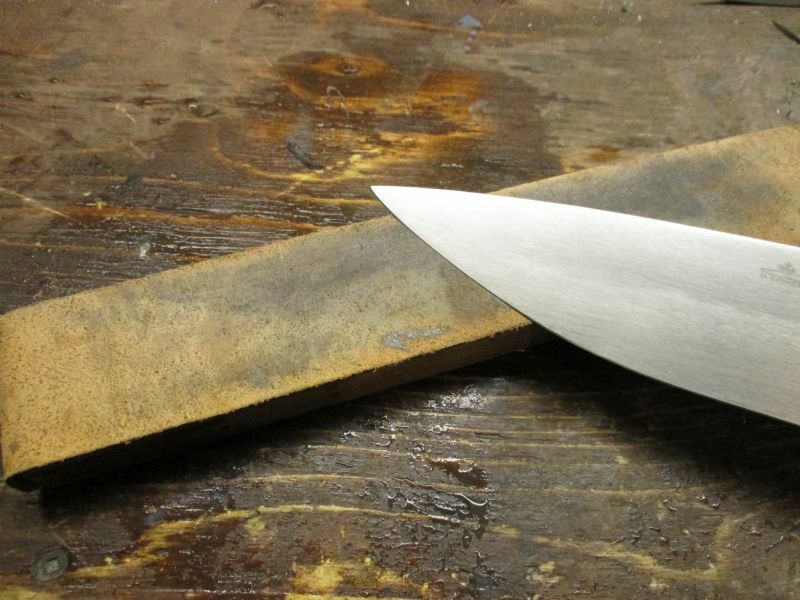 We'll shape the handle, buff and sharpen next. 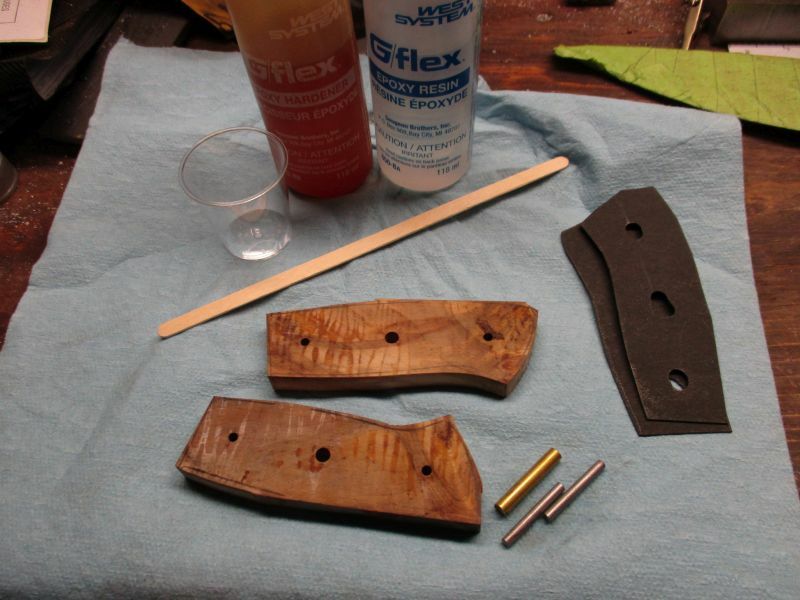 Yes, I bought some cheap locking grips at the dollar store and epoxied leather pads to the jaws. 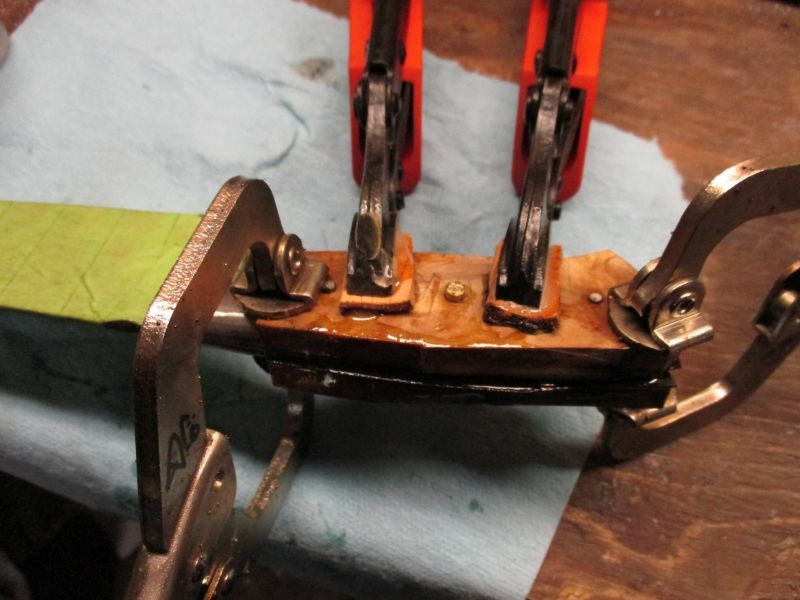 These eventually get covered in epoxy so I hate to use my brand new 'expensive' Vise-Grip brand for messy glue ups. I wrap everything in saran wrap for a couple of layers and then clamp up. 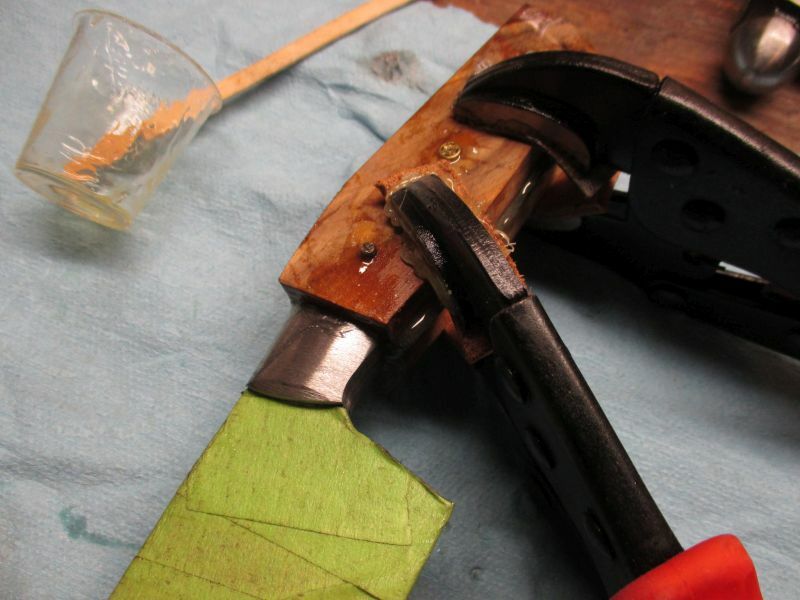 Learned this after gluing a clamp to a handle once. After about 24 hours the glob looks like this. The clamps came off without incident. With the 36 grit belt I knock back the flat on two faces. Once the two faces are flat, take it back to the steel all the way around. Now I start putting the round in it by knocking off the corners. Some makers prefer the large contact wheel for this but I like the flat platen. 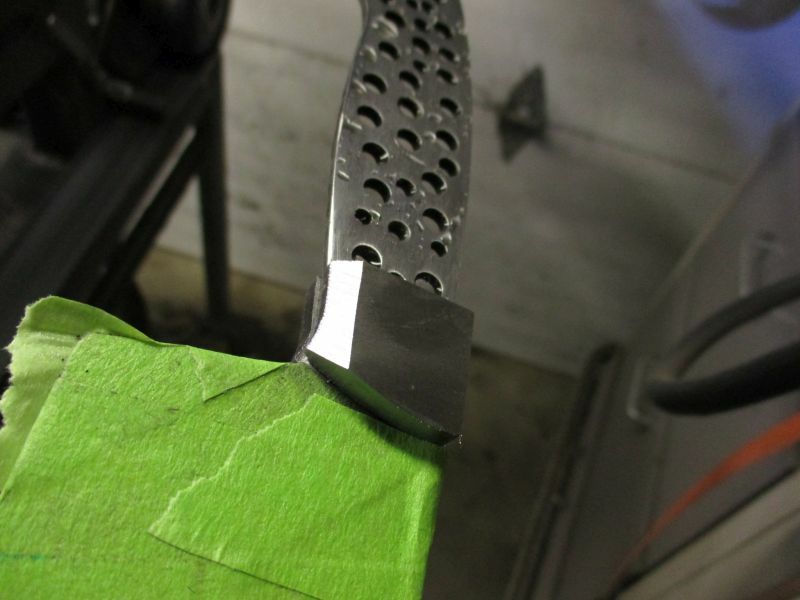 The 36 grit belt is pretty aggressive so one has to be careful with pressure and keel the handle moving. I shape the wood back almost to meet the steel, about 1 mm higher. Once the wood is close to the shape it's on to the slack belt. This belt is a 60 grit. 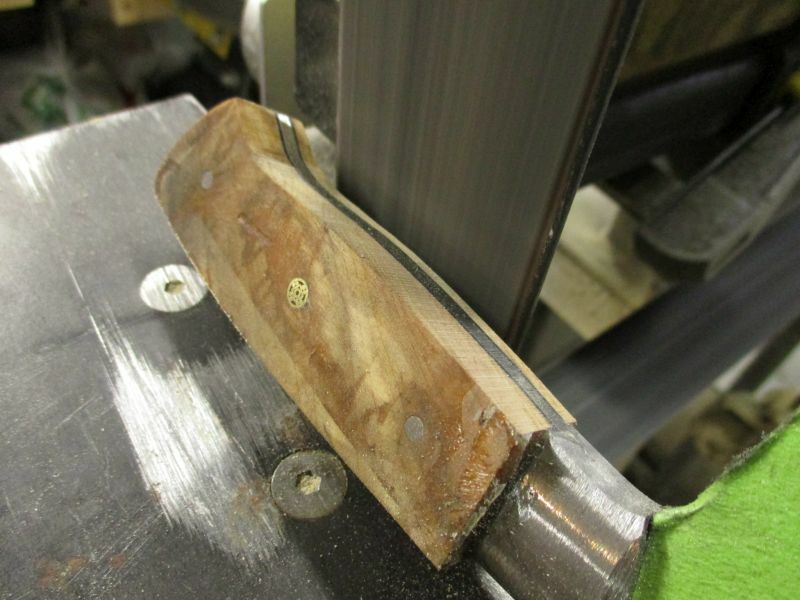 Repeating the slack belt treatment with a 220 grit belt. 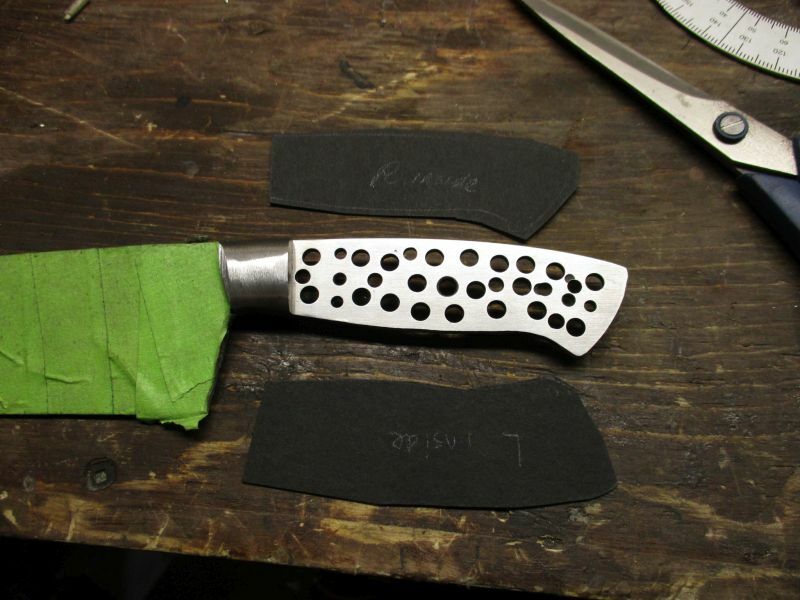 I am working with pressure on the bolster and rotating the knife around and 'round. And again with a 400 grit belt. Looking awesome Dan. 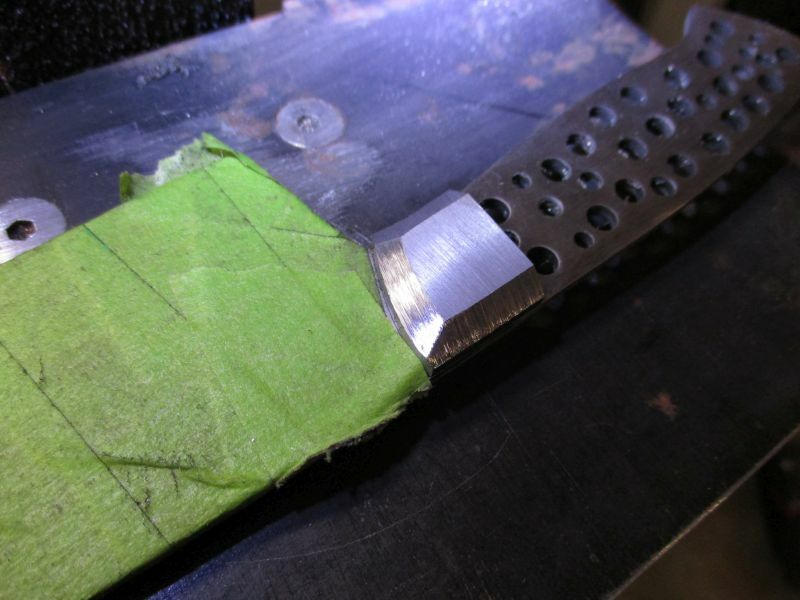 This is probably my favorite part of knifemaking. 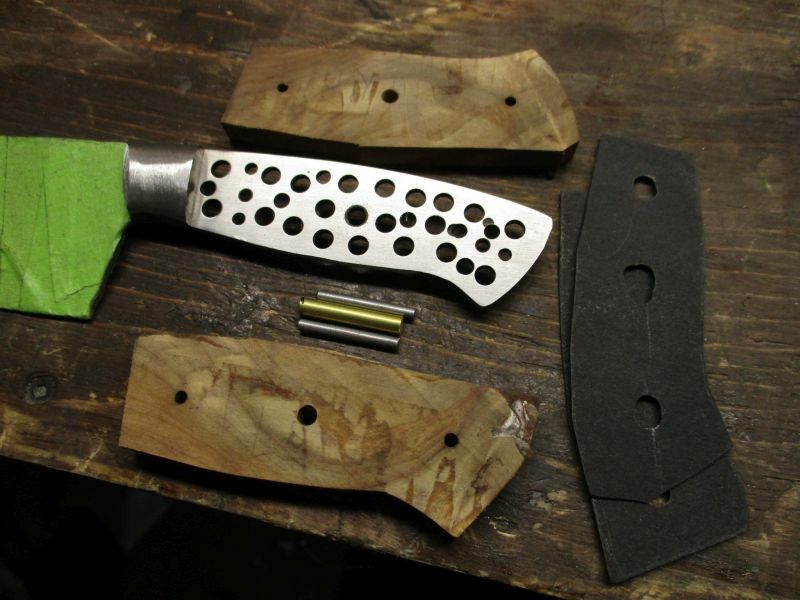 I love seeing the ugly, messy blob take shape and really start looking like finished and usable knife. and buffed with some green compound. I don't want the compound to contaminate the wood. For setting the cutting edge I cheat a little. A good old worn out 220 grit aluminum oxide belt. Slowing the belt down and setting the angle around 15°. Then over to the 3000 grit water stone. Followed by the 5000 grit water stone. And lastly on the leather. 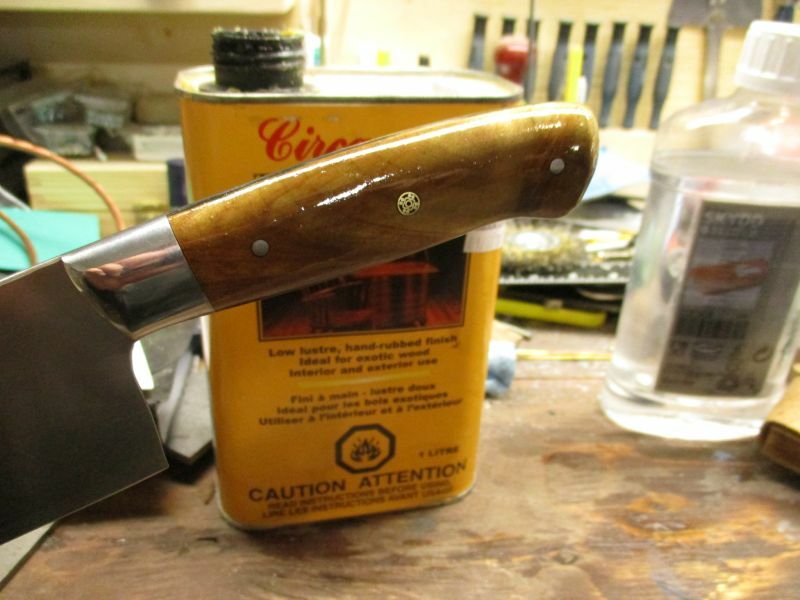 To finish the handle, I coat with tung oil and dry with a heat gun on low heat. That's pretty much it. I cleaned up the front of the bolster down to the cutting edge with a little sanding drum on the Dremel. Got the light box warmed up, wiped it down and took some photos. 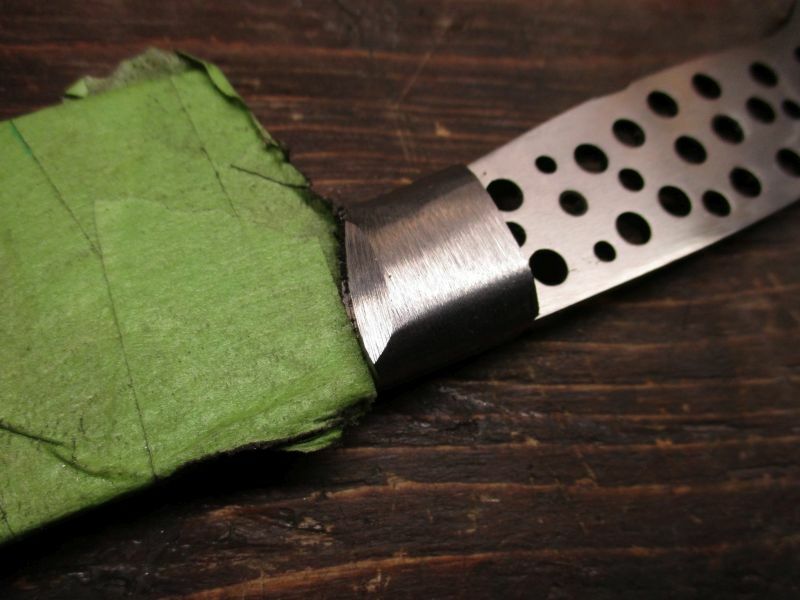 I love the idea of using corks to protect both the blade and the new owner. 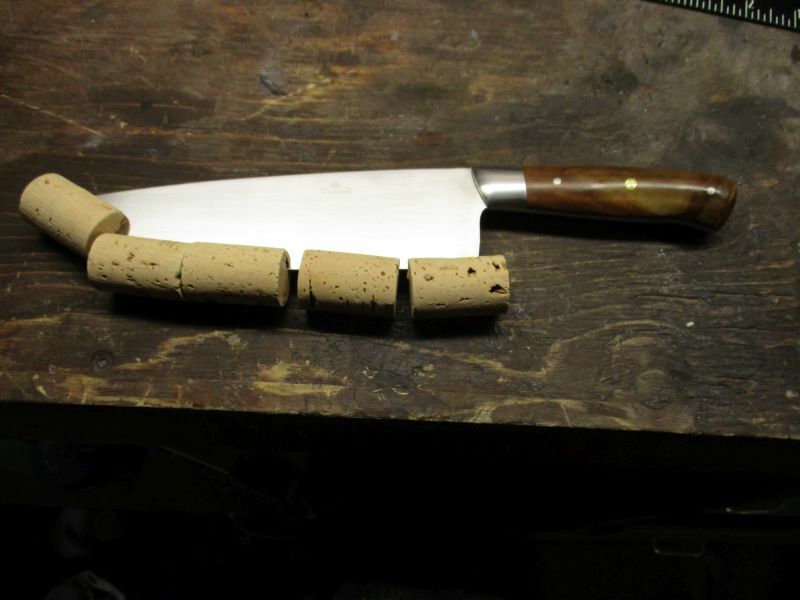 I put some wine bottle corks and press them on the blade. BE VERY CAREFUL IF YOU DO THIS! 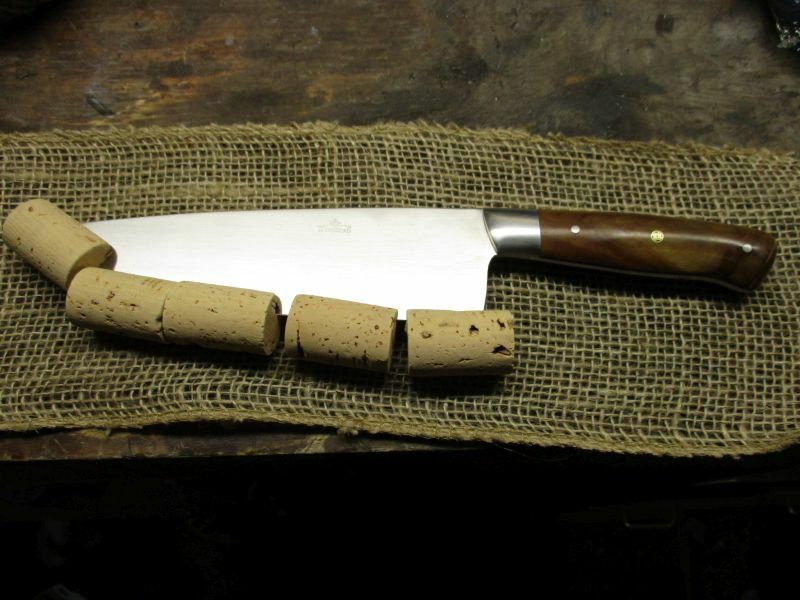 >> It is super easy to have the cork roll and you WILL be pressing very hard on your thumb or fingers with a razor sharp knife. The corks are hard and a slip will cut you stitches bad. 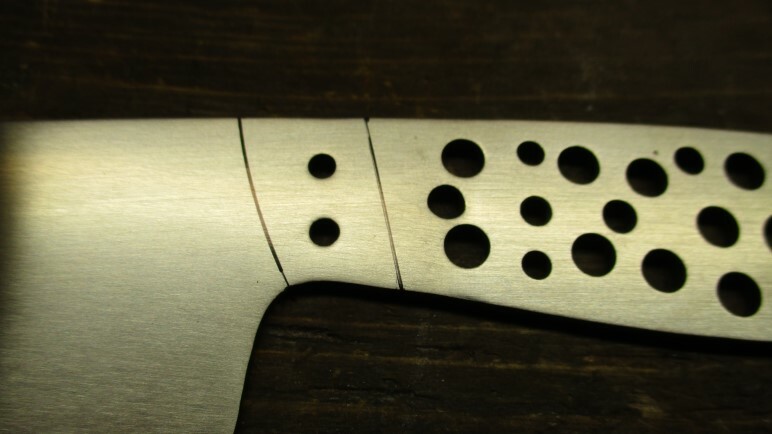 Put the corks in a soft-jawed vise and press the blade into them. 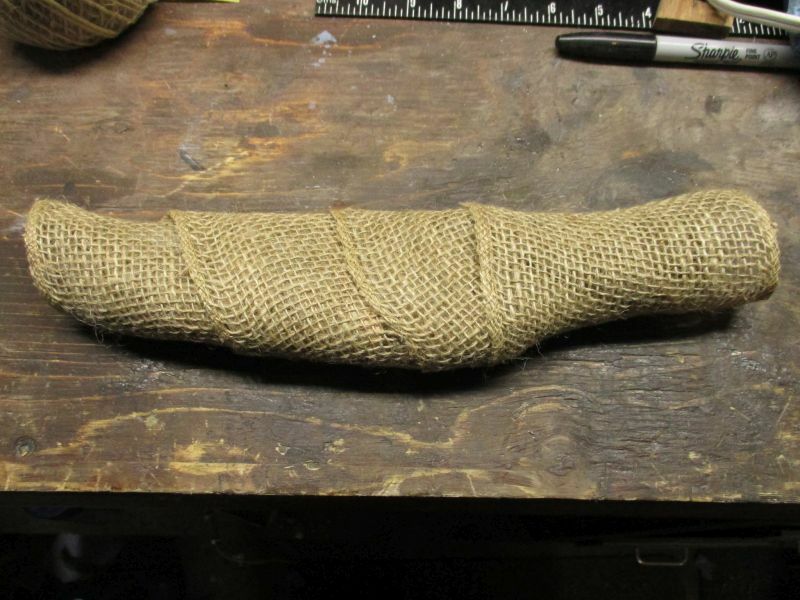 Now some dollarstore burlap. I think this product is for plants or something. 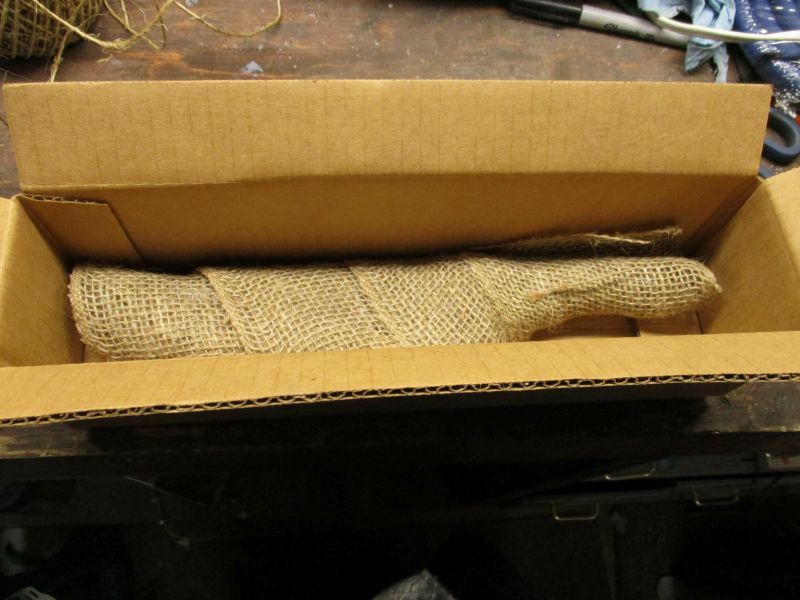 The mummy wrap. If you have some fancy sisal string or ribbon, you can do your best to impress. 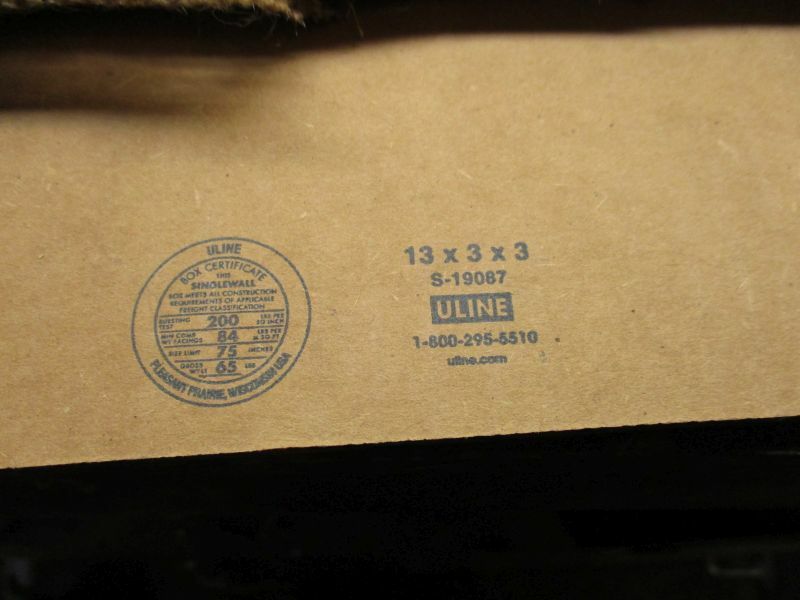 The box for me is ULINE 13x3x3. This is roughly how it fits in the box. 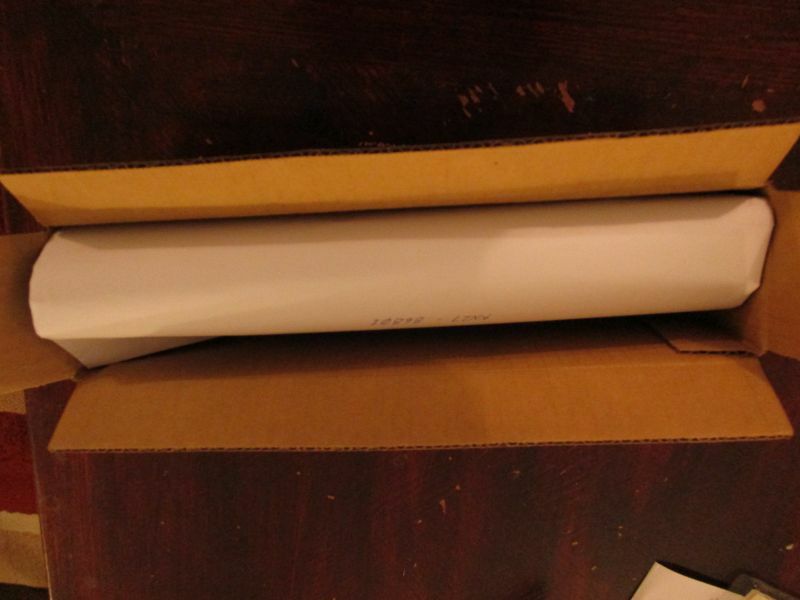 I'll take some kraft paper (recycled from Amazon) and shield the product. Failing that some good old newspaper. The cheesy local stuff works great. "Kid wins first prize in colouring contest." kind of stuff. 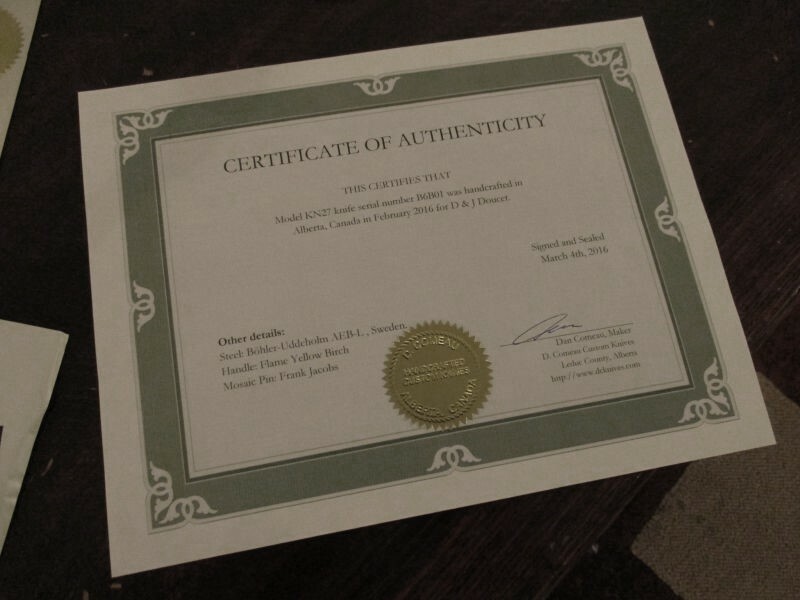 The shipped documents include a Certificate of Authenticity (COA) and a datasheet. The COA states the model number, serial number, customer, date and basic materials as well as the maker's signature and maker's seal. 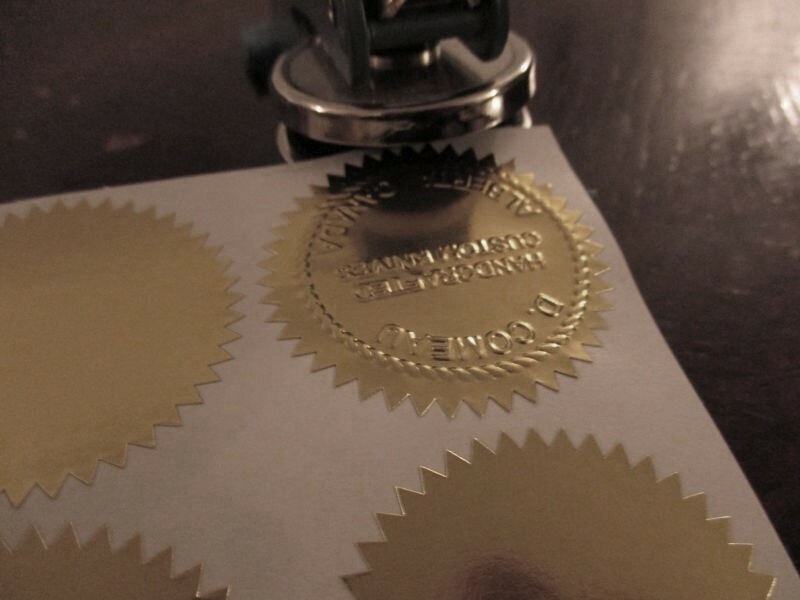 My seal is an embossed gold foil seal that is stuck to the certificate. weight, dimensions and basic care instructions. Into an envelope and into the box. Tape seal with clear packing tape and we're done. Sometimes I include a USB flash drive with construction pictures. I will almost always include some stickers and business cards. I hope this helps in getting a professional package to your customers. parker and Martin like this. Nice clean package Dan. 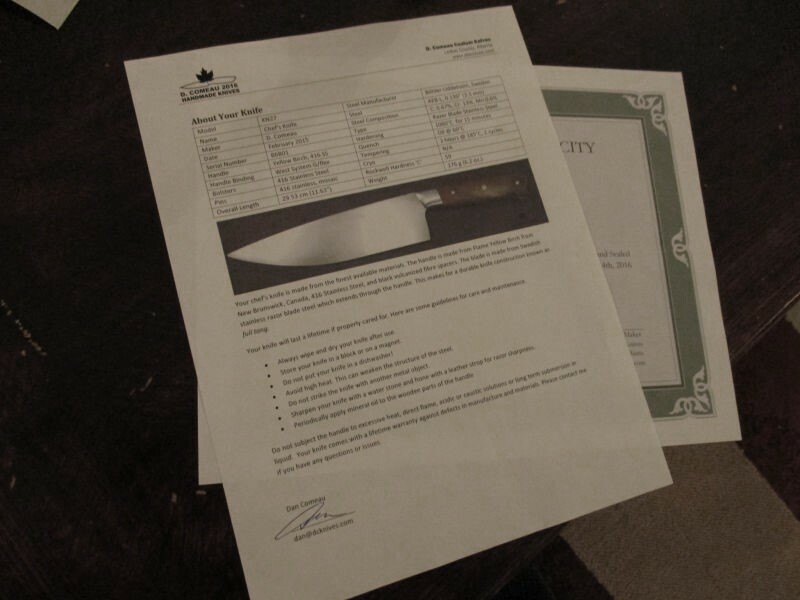 With your data sheet template and certificate, it probably doesn't take very long to prepare the documentation, and it sure does make a nice professional presentation to your customers.